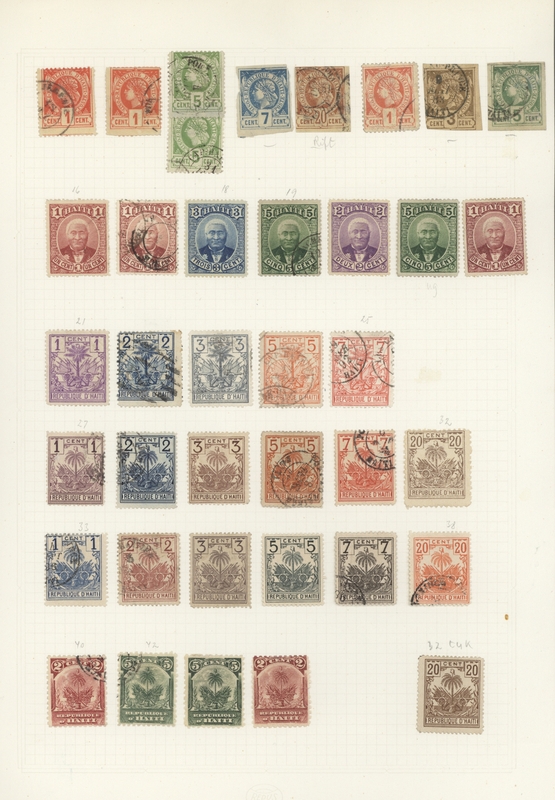 29821 ungebraucht ohne Gummi (unused without gum) (*) ungebraucht (hinged) * gestempelt (marked) 1881/1982: Collection of hundreds of mint and used stamps from the first issues onwards housed in a very well-filled album, including 1880s liberty heads complete, 1887 Salomon 5c green unused, 1891 palm trees inc. 2c and 5c imperf pairs, 1898 President Sam complete mint inc. proofs on thick paper the 2c single and 1c and 7c pairs, through to a useful range of early 20th century surcharges, 1903 7c Dessalines imperf proof of frame only and inverted centre, 1910 Simon 5c mint NH, etc, through to 1980s. 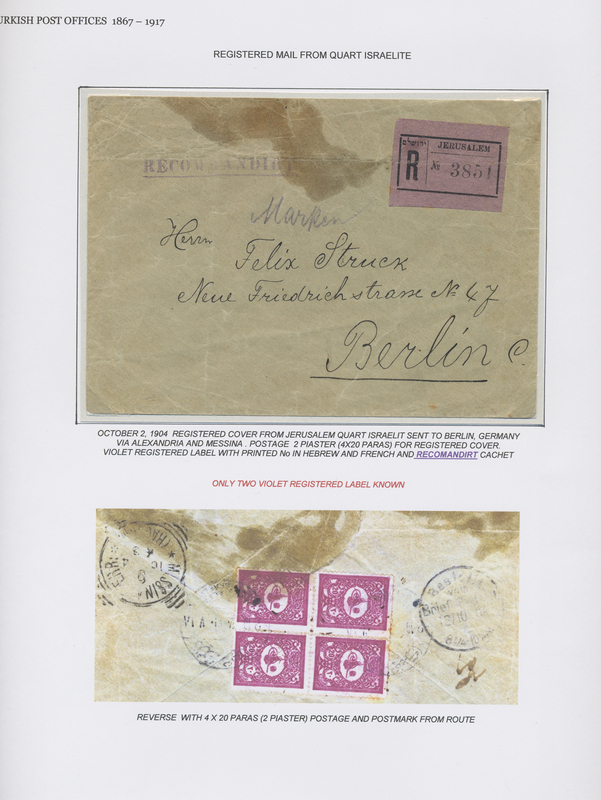 Please inspect. 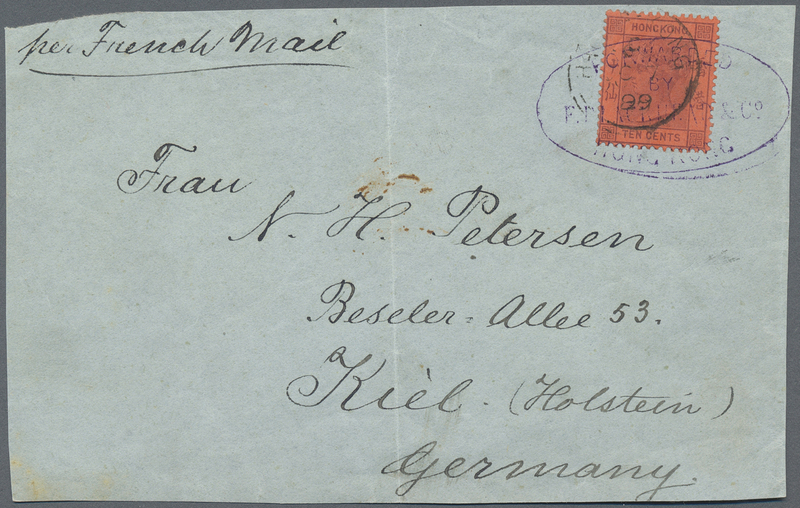 29822 gestempelt (marked) Brief (cover) 1881-1890, Sammlung mit 21 Einzelmarken und einem schönem Brief mit waagerechtem Paar 5c. 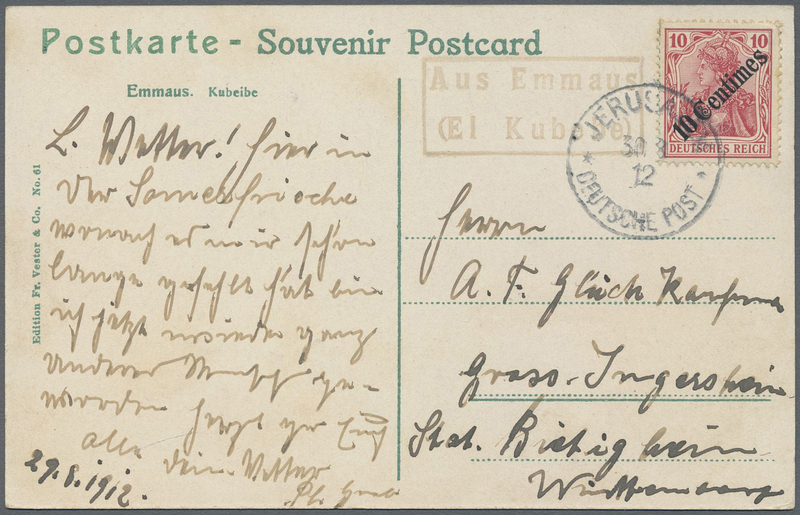 Liberty gezähnt von Aux Cayes nach Hamburg. 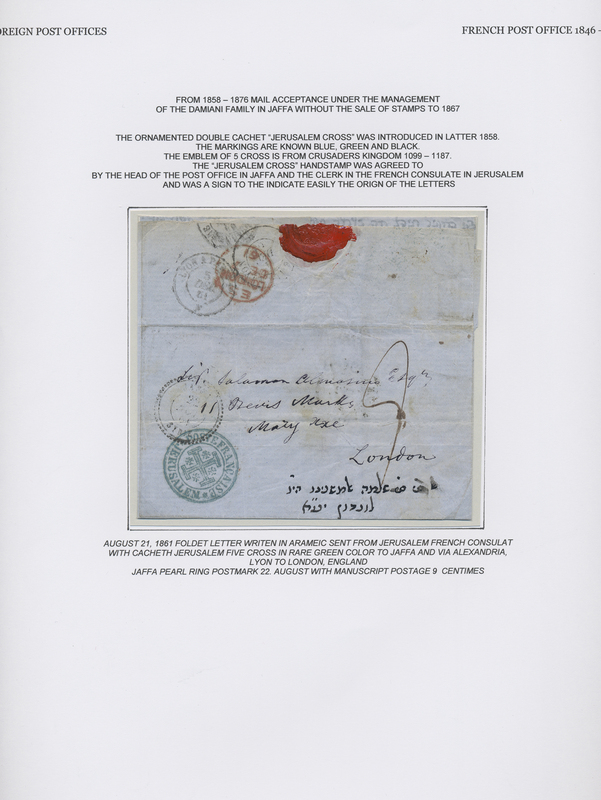 Briefe mit Liberty-Köpfen sind sehr selten! 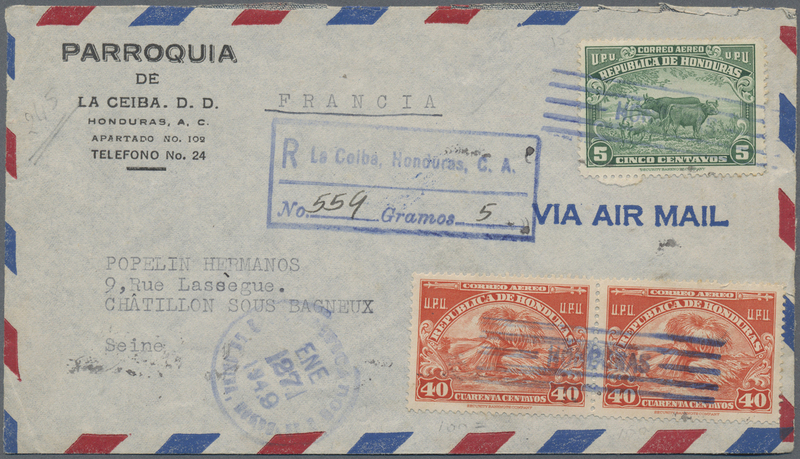 29824 1953/1999. 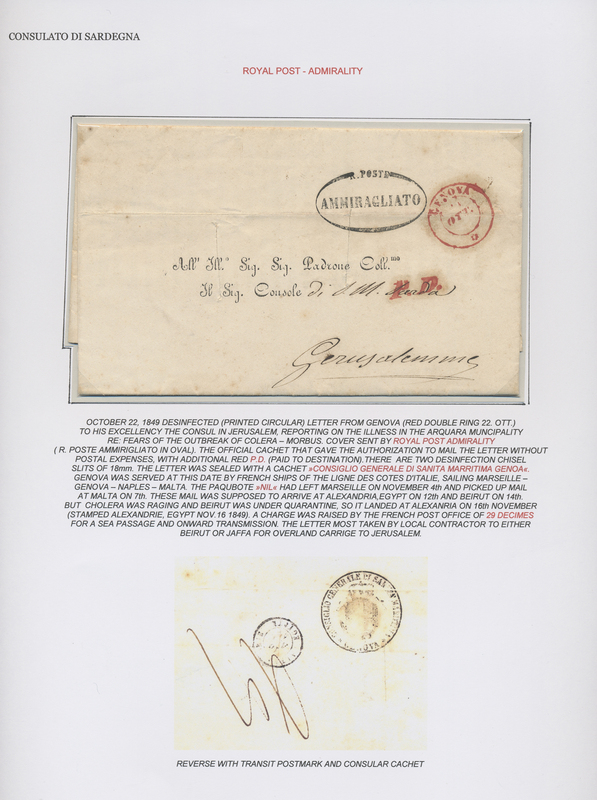 Album official collection of the Couvoisier archives (Only series kept= of 545 no dentele´s or essays + 11 felt blocks, fixed on numbered pages. 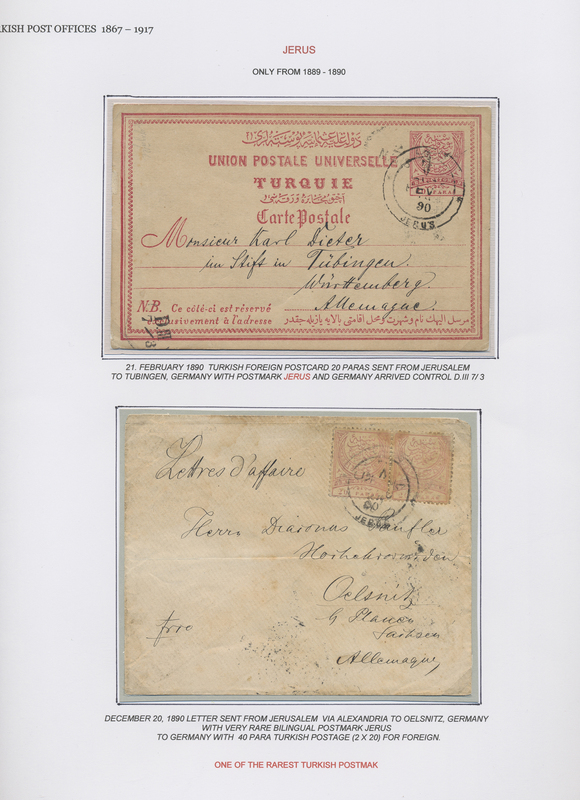 23 series including Magloire, Kant, ONU, MARINE, Fleurs, "The unknown slave", Christmas, Osaka, 200° years USA, Apartheit, slavery. 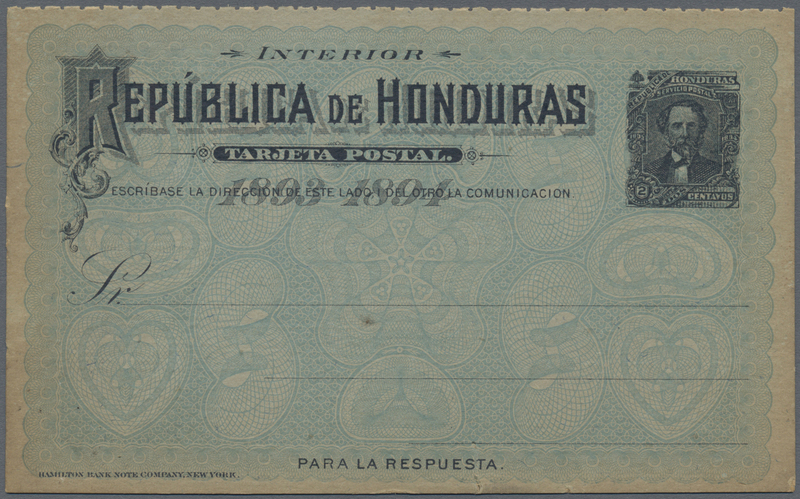 ÷ 1953/1999. 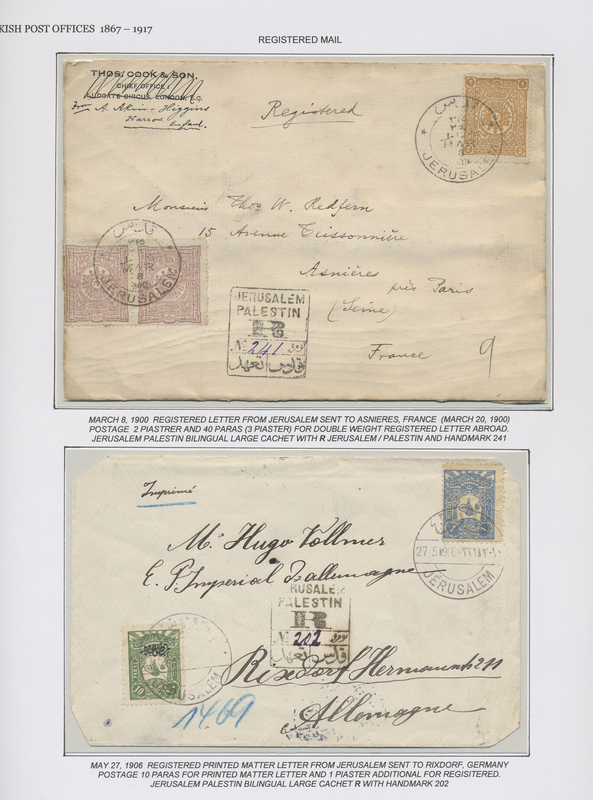 Album collection officielle des archives Couvoisier (Seule série conservée= de 545 non dentele´s ou essais + 11 block feullets, fixés sur pages numérotées. 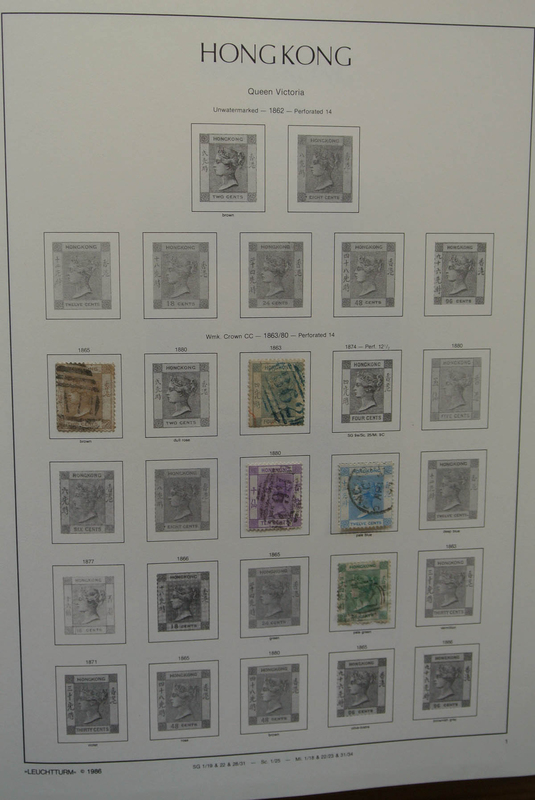 23 séries dont Magloire, Kant, ONU, MARINE, Fleurs, Le Marron du St-Domingue, Noël, Osaka, 200° an USA, Apartheit, esclavage. 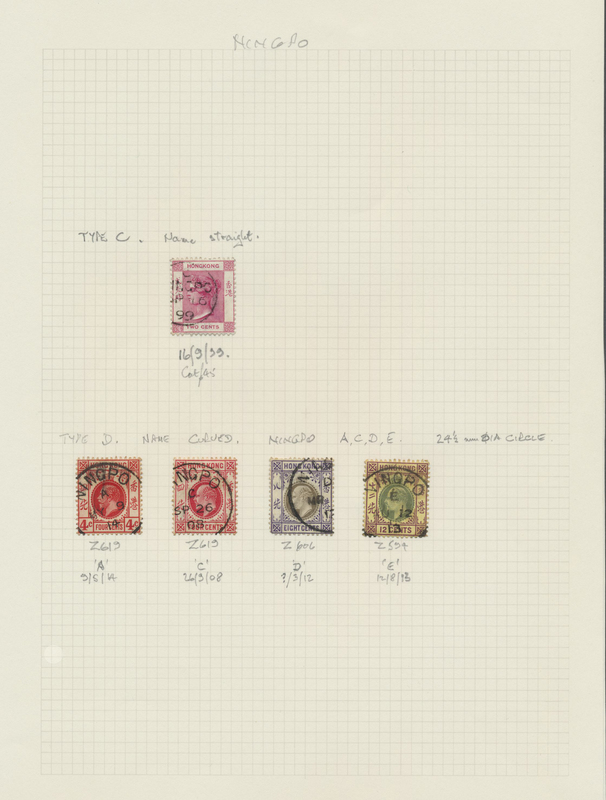 29831 ungebraucht ohne Gummi (unused without gum) (*) ungebraucht (hinged) * gestempelt (marked) 1866/1972: Very useful collection of hundreds of mint and used stamps housed in an album, starting with an interesting range of classic pyramid issues with Comayagua and Tegucigalpa printings including unusual used pairs, then the 19th century highly complete from 1878 onwards, through to back of the book and 20th century to the 1970s. 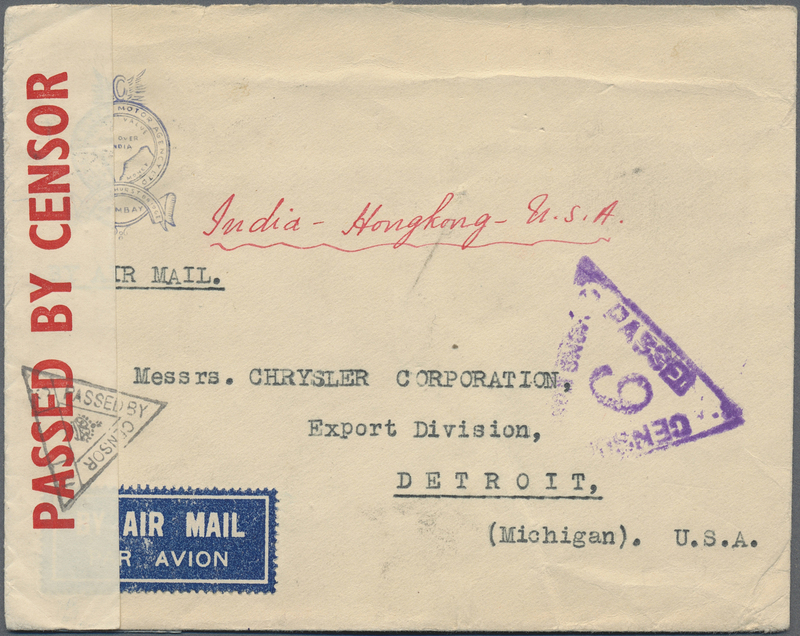 Please inspect. 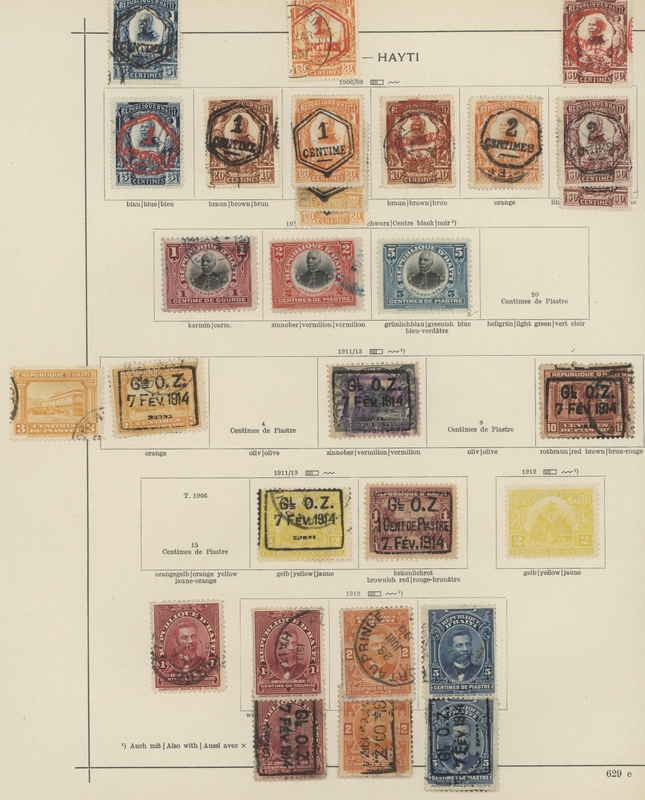 29834 Ganzsache (Complete) 1880/1995 accumulation of ca. 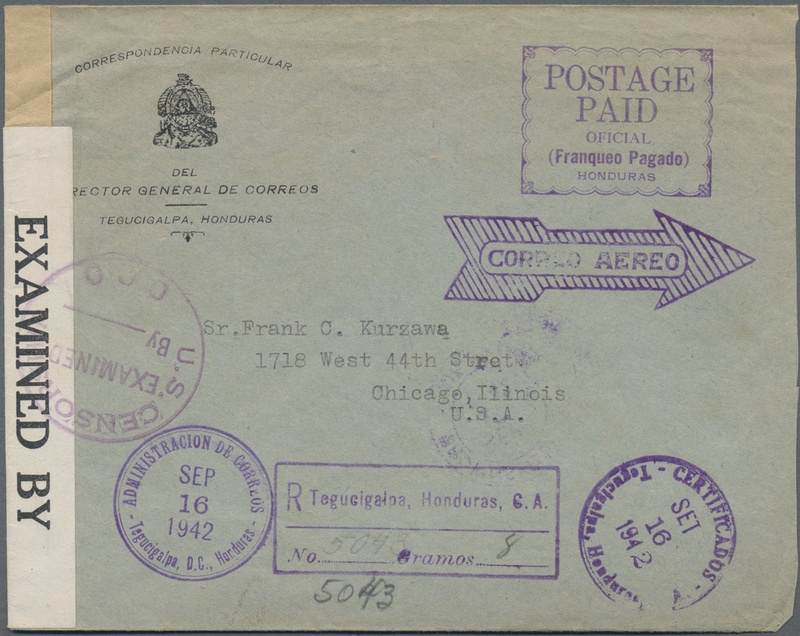 1114 AEROGRAMMES incl. 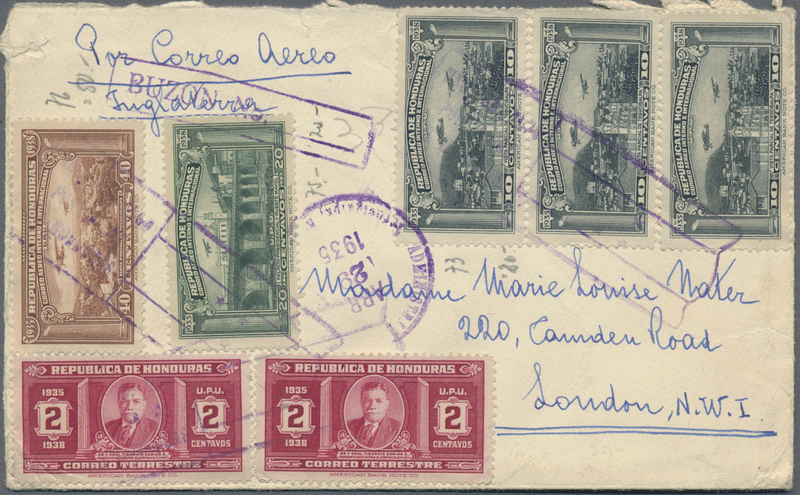 some older unused postal stationery cards and doublecards, some heavy duplication, but also some interesting thematics, types etc. 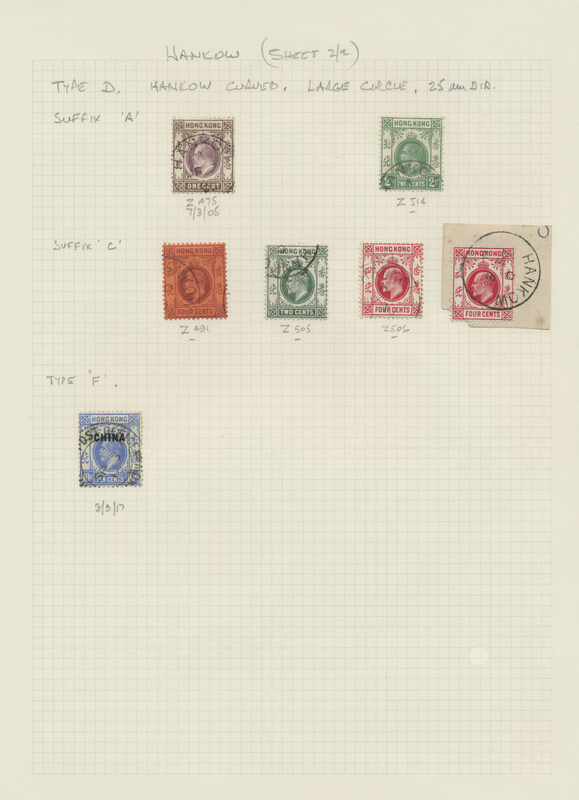 29836 ungebraucht (hinged) * gestempelt (marked) 1862/1931, mint and used collection in a Leuchtturm stock book (Michel cat. 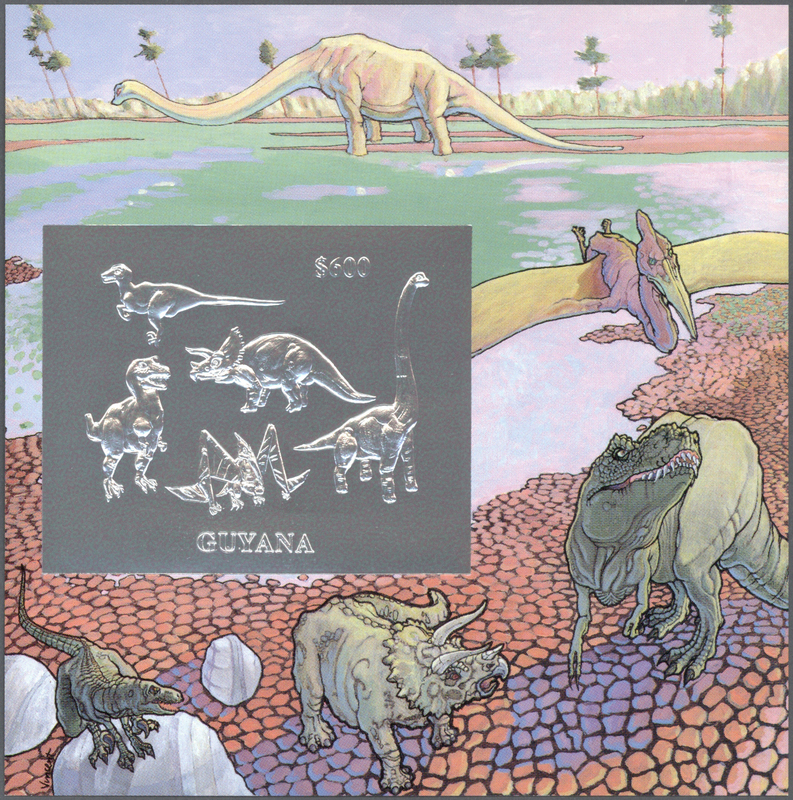 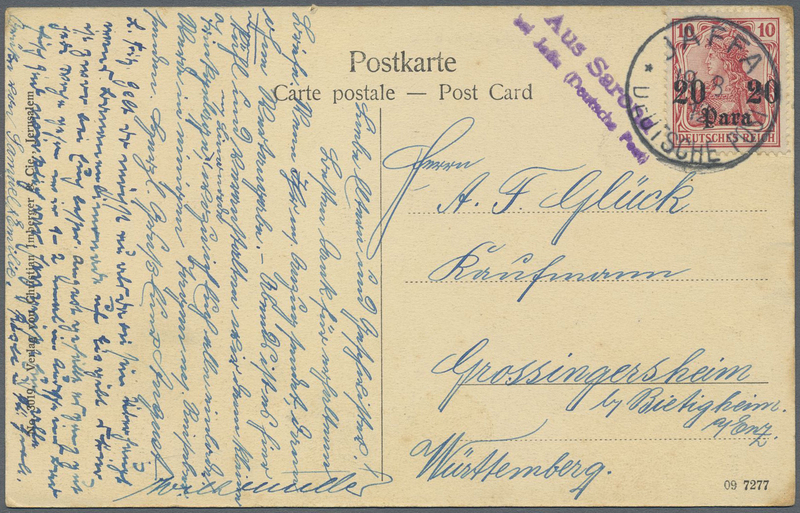 ca.5000-.) . 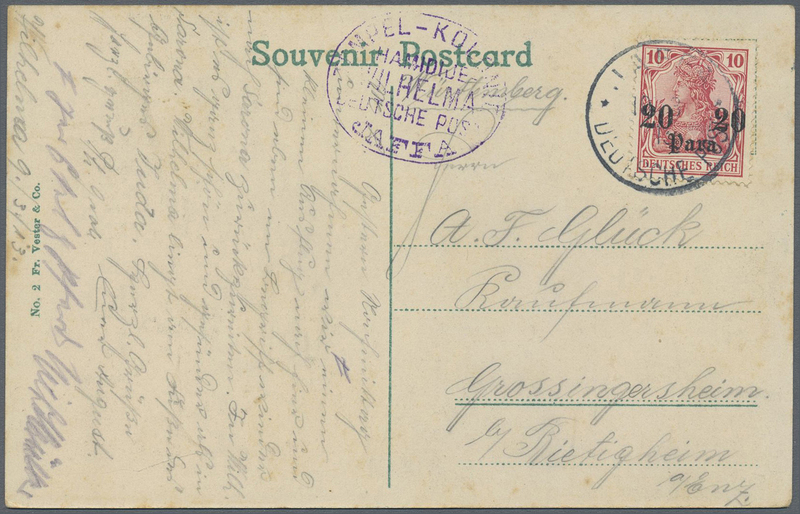 29837 postfrisch (never hinged) ** ungebraucht (hinged) * gestempelt (marked) 1862/1992 (ca. 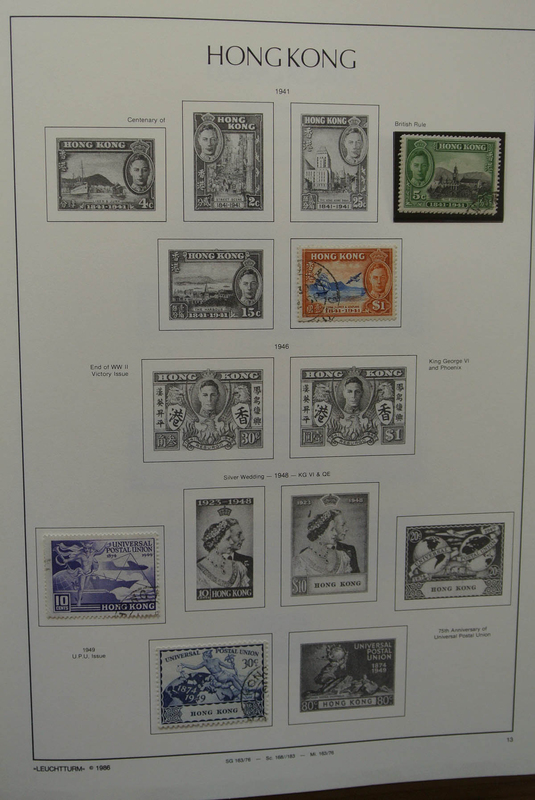 ), collection with mint never hinged, mint hinged and used issues, as well as booklets. 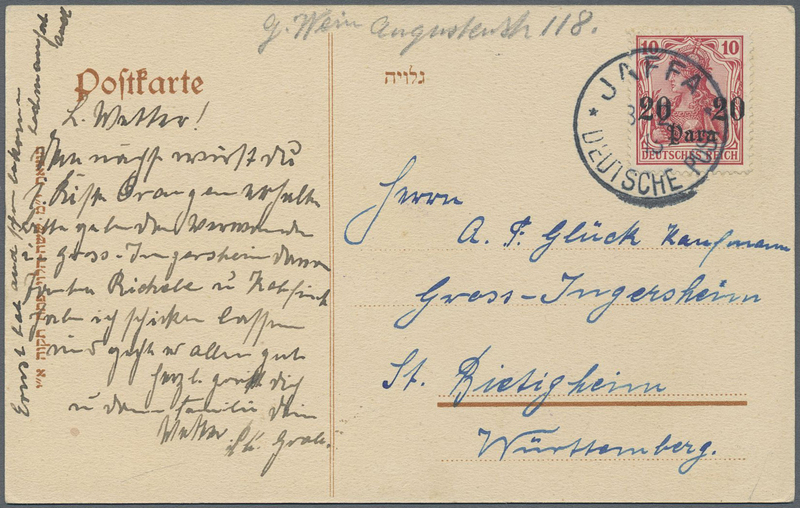 29839 postfrisch (never hinged) ** ungebraucht (hinged) * 1862-1949, Mint collection in a printed Lighthouse album, from 1862 unwatermarked 18c. 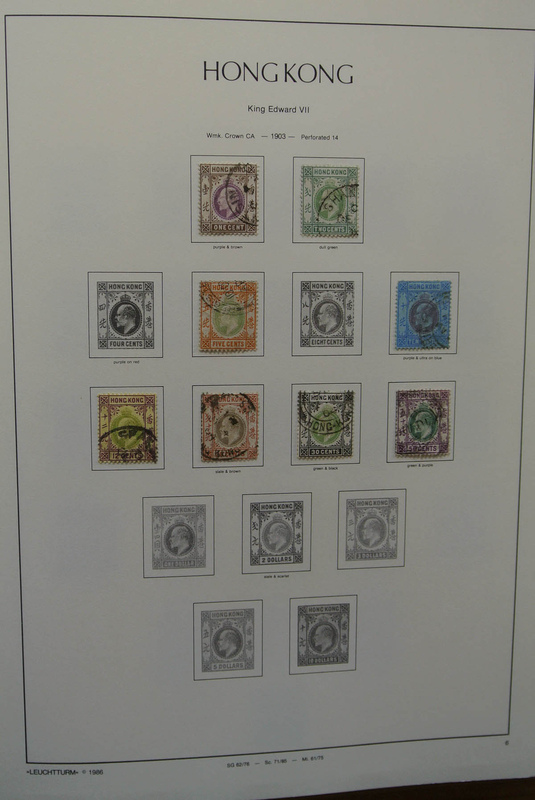 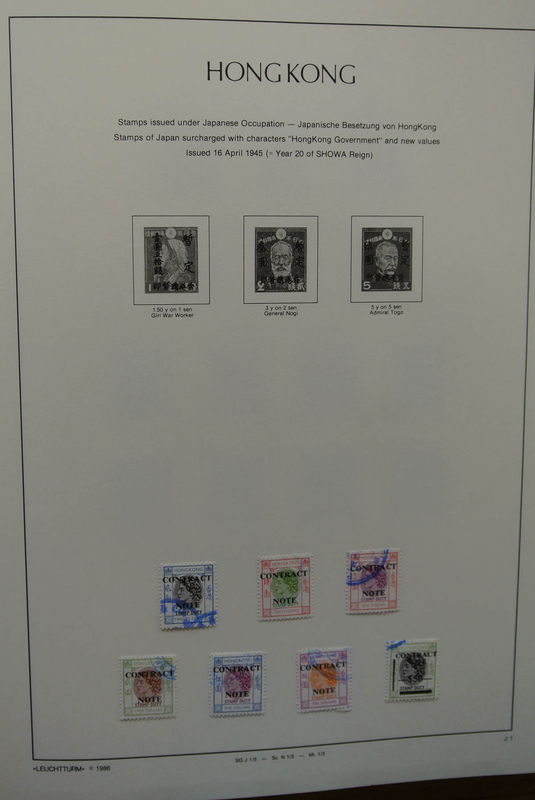 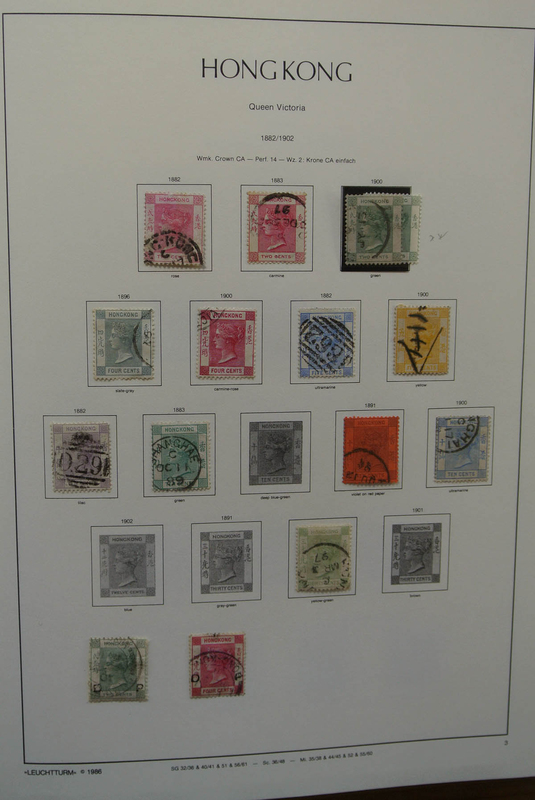 to 1949 UPU, plus Postage Due, Postal Fiscal stamps and (more than) complete sets of KGV. 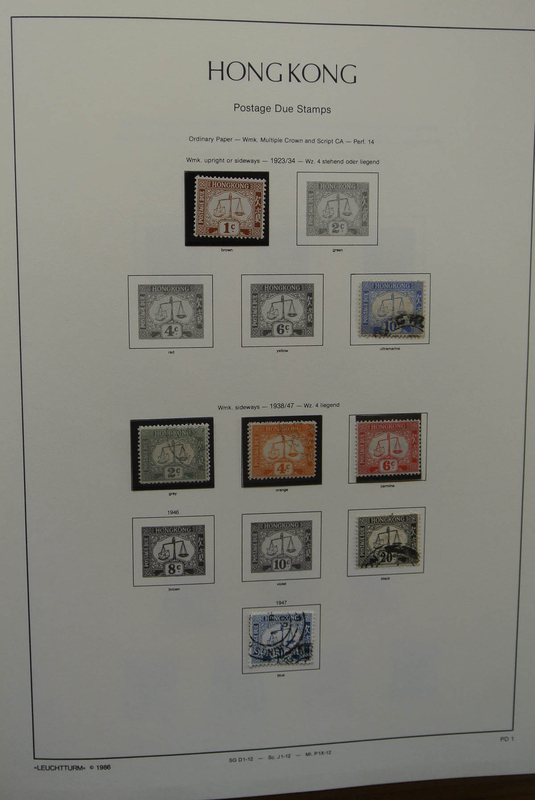 stamps optd. 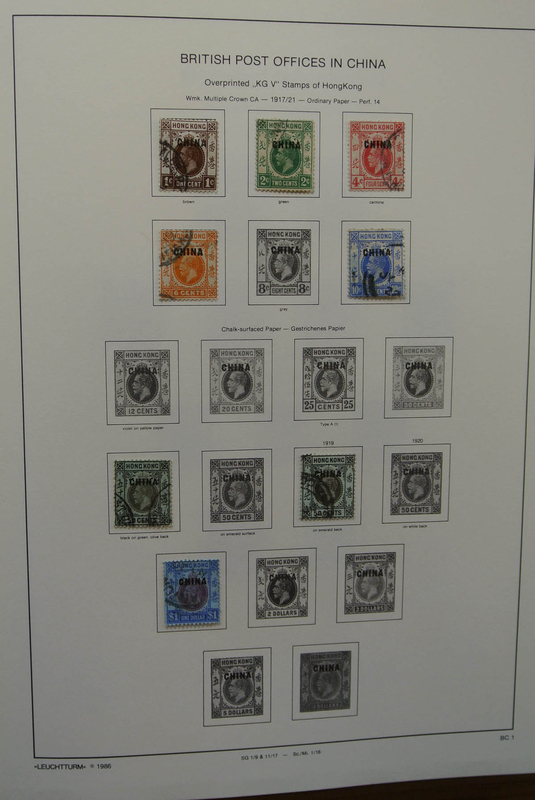 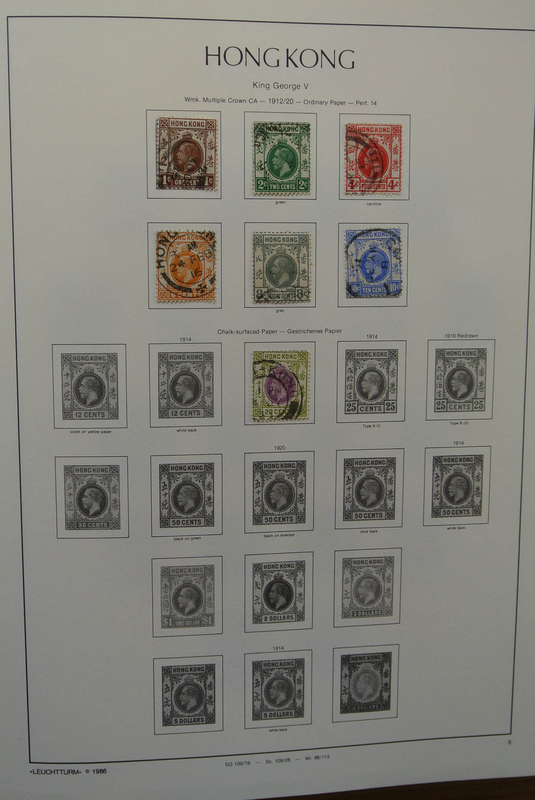 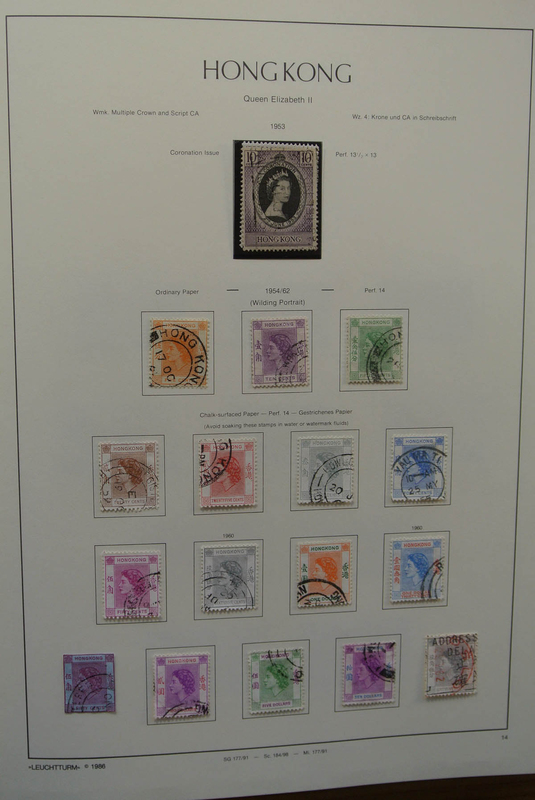 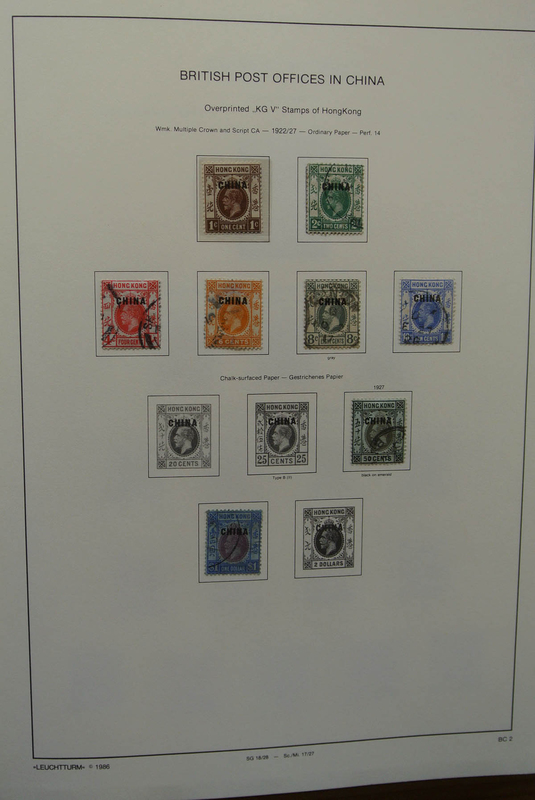 "CHINA", with many good stamps including colour shades, various papers, multiples incl. 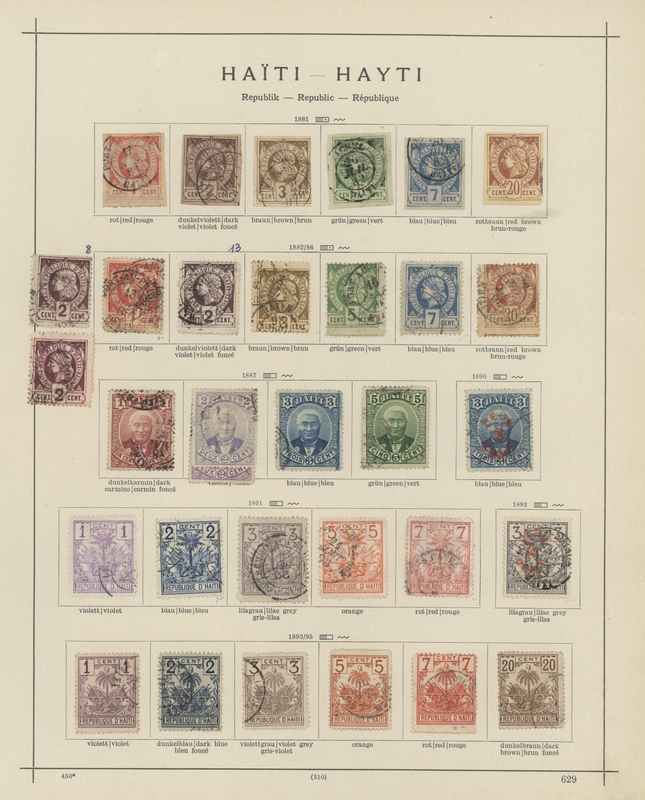 Plate blocks and pairs, varieties as plate flaws, several stamps surcharged "SPECIMEN" (printed or handstamped), etc., containing QV issues, KEVII. 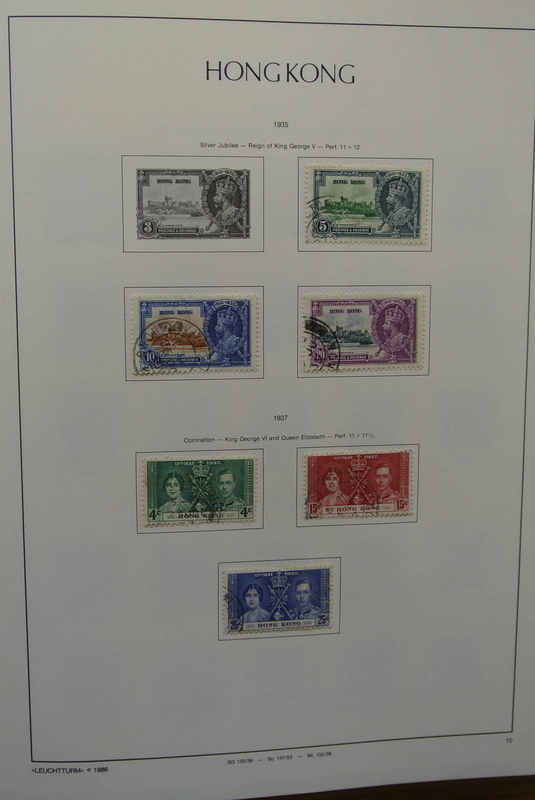 sets to both $10, KGV. 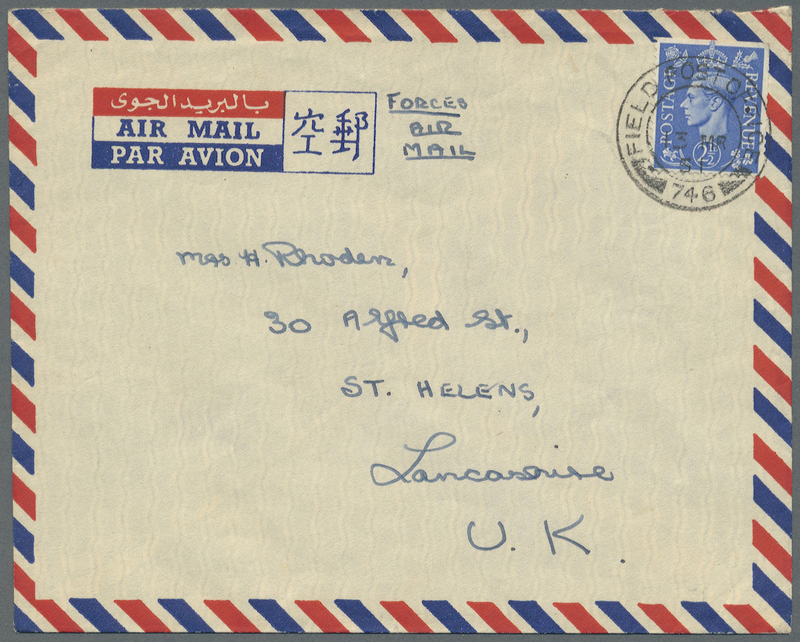 and KGVI. 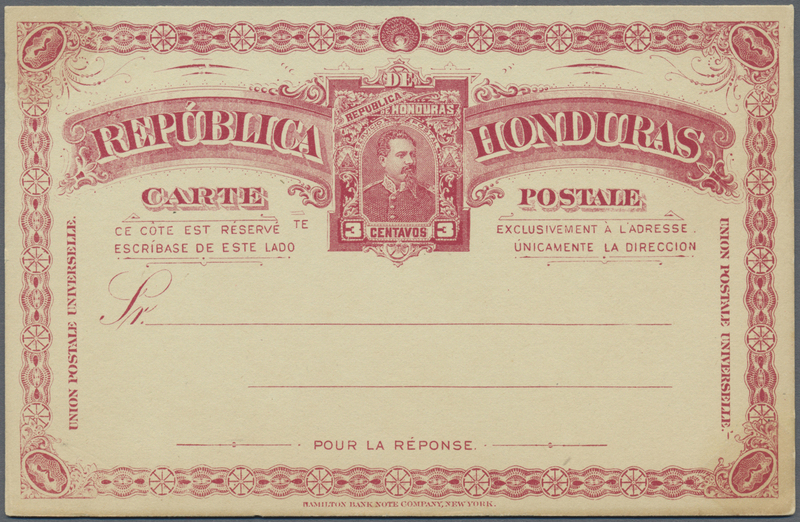 definitives up to all $10, etc. 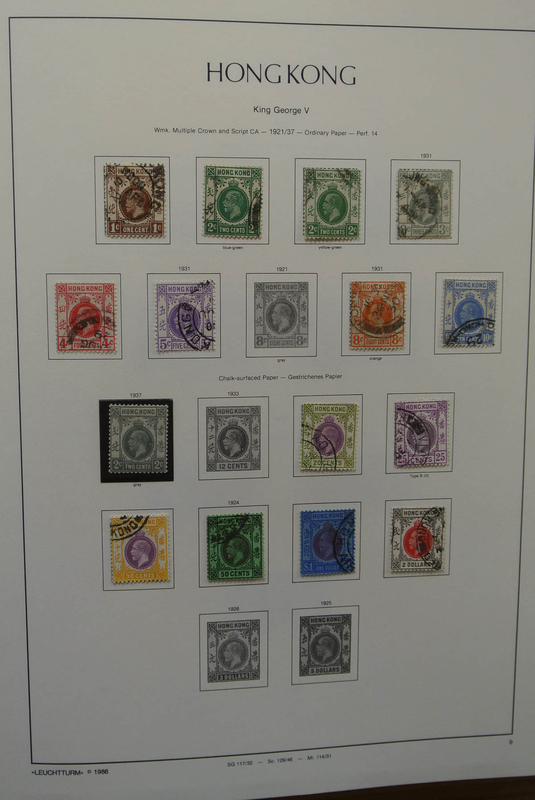 Few stamps of early issues without gum, few others lightly toned/stained, but an almost fresh and fine collection in general. 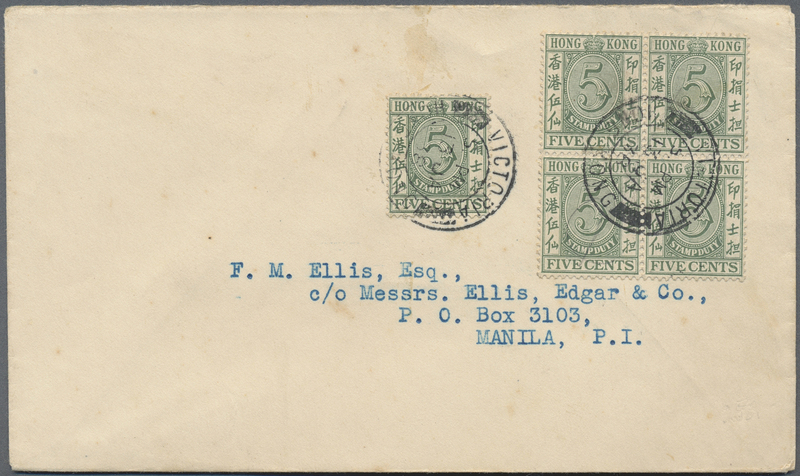 29840 gestempelt (marked) 1862-1949, Used collection in a printed Lighthouse album, from first issue to 1949 UPU plus Postcard stamps, Postal Fiscals, Japanese Occupation and KGV. 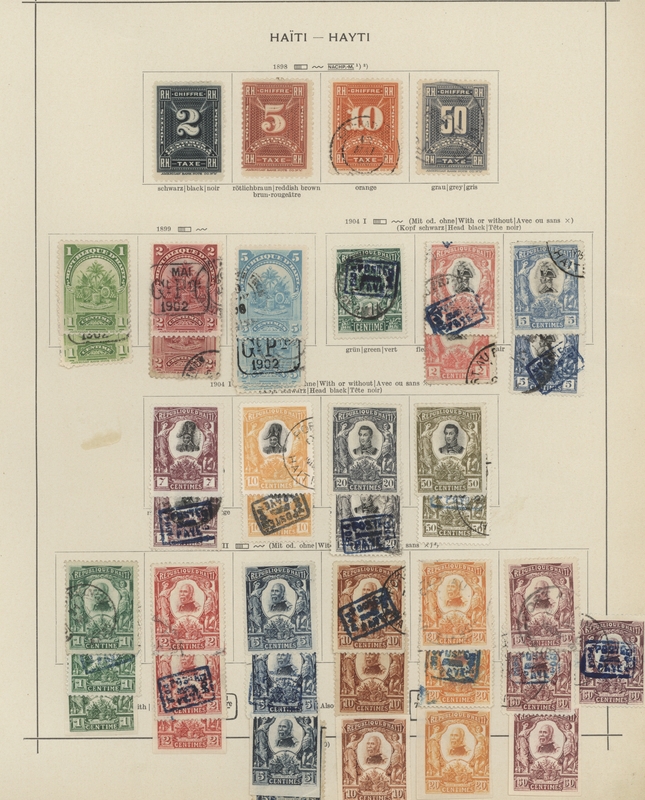 stamps surcharge "CHINA", with many good stamps and key items up to several $5 and $10, colour shades, various papers, multiples, varieties as plate flaws, interesting cancellations incl. 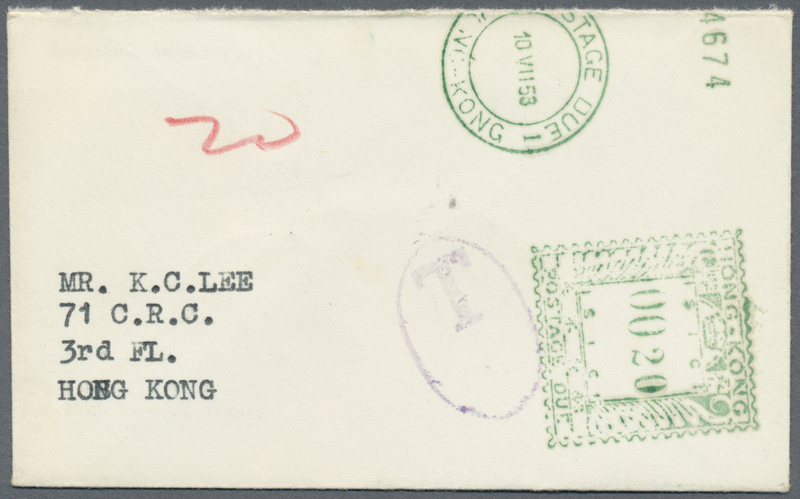 those from British P.O.s in China, and a few covers and postcards. 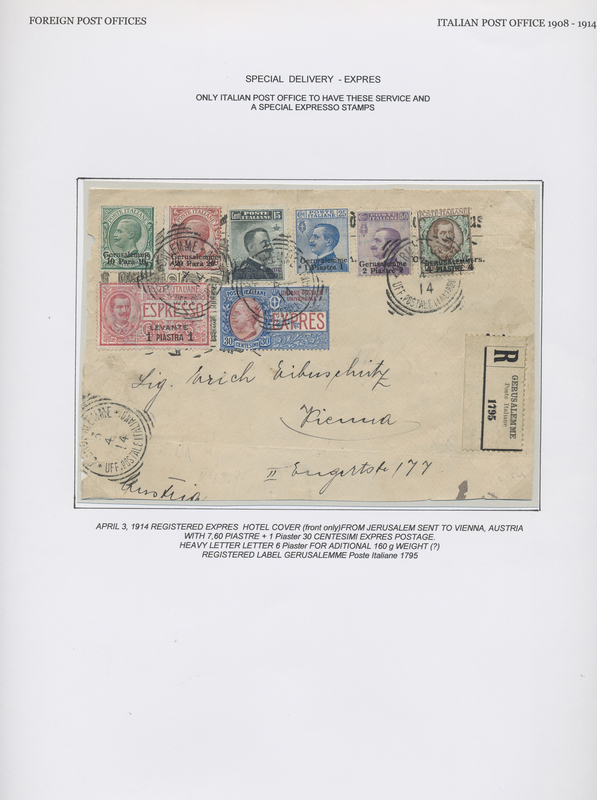 29841 postfrisch (never hinged) ** gestempelt (marked) ungebraucht (hinged) * 1863-2011, initially unused and used, from about 1960 only VF mint never hinged collection in two volumes from Mi. 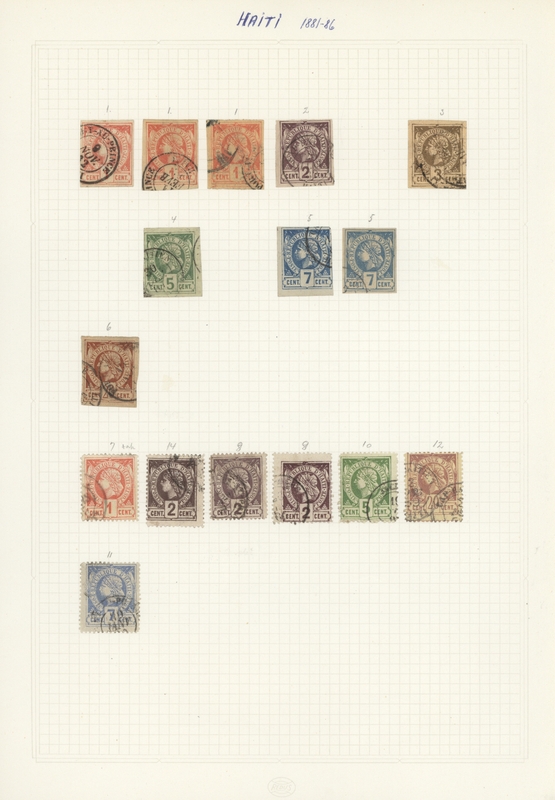 8-15 used with better values and sets as Michel no. 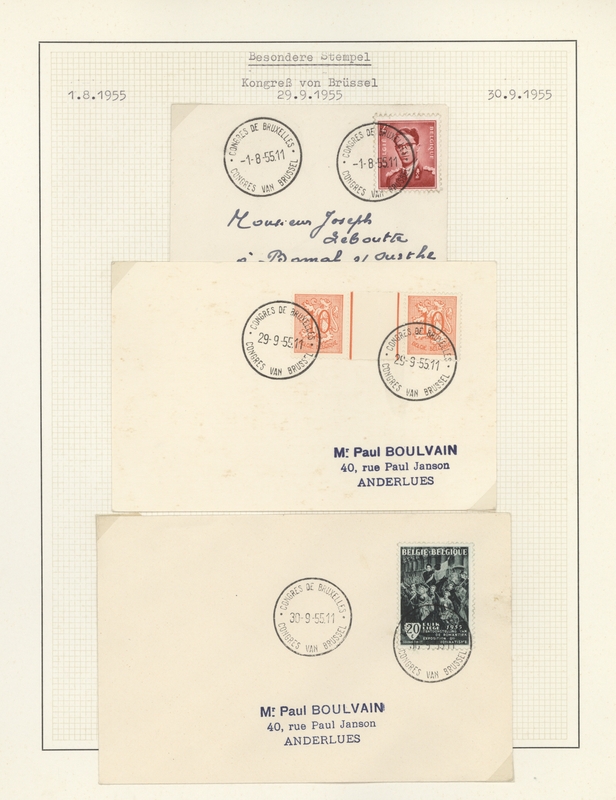 46-47 used, Michel no. 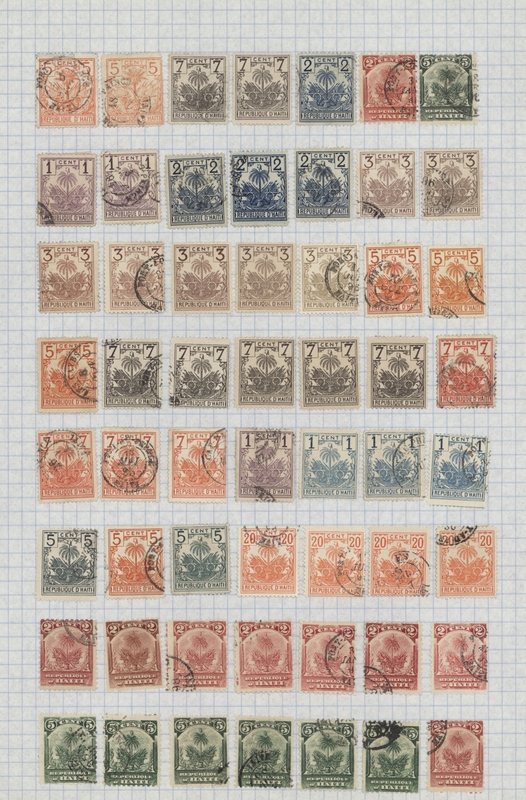 132-38 unused and used, Michel no. 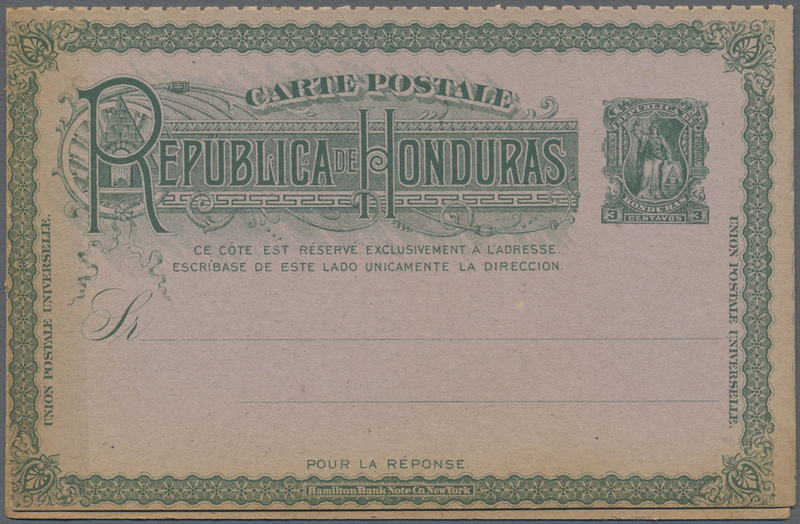 173-76 unused, Michel no. 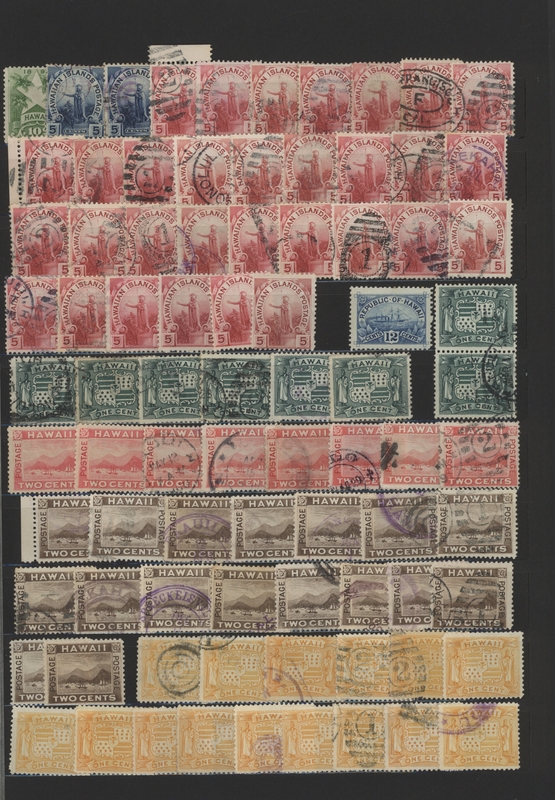 246-47 mint never hinged etc, besides, also approx. 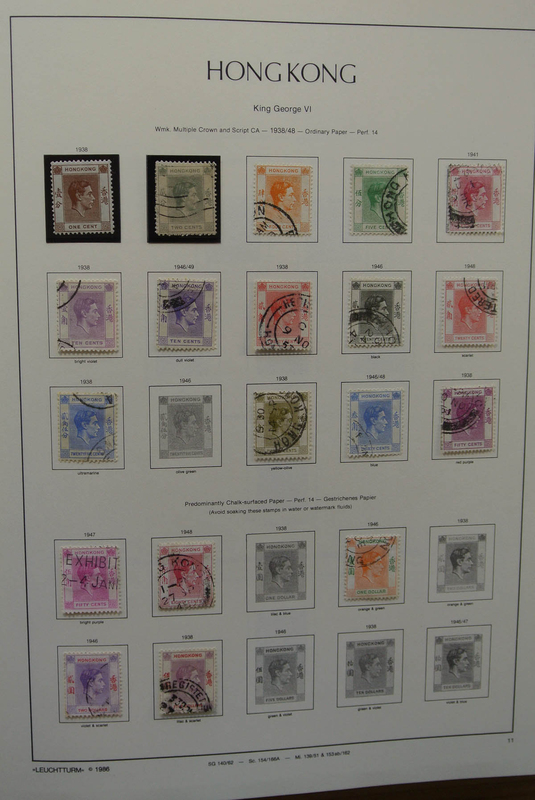 100 mint never souvenir sheet issues from no 1, miniature sheets and booklets, Michel approx. 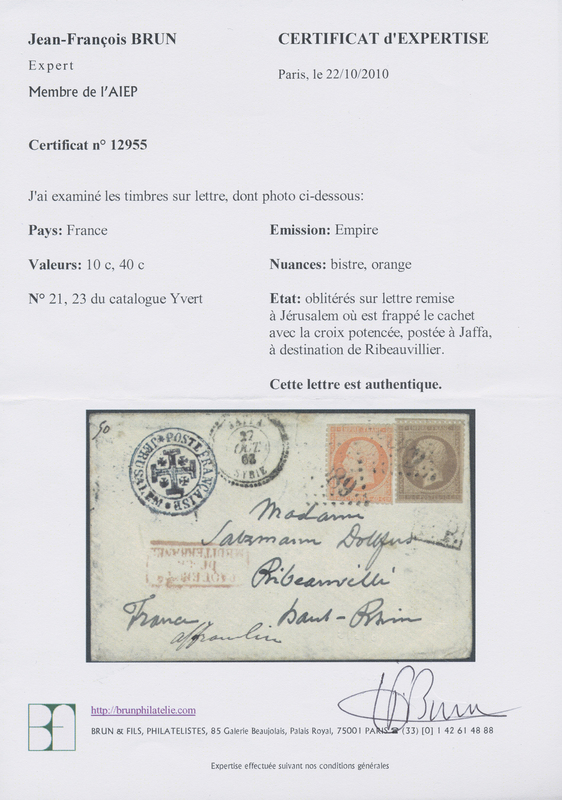 4.700, - Euros. 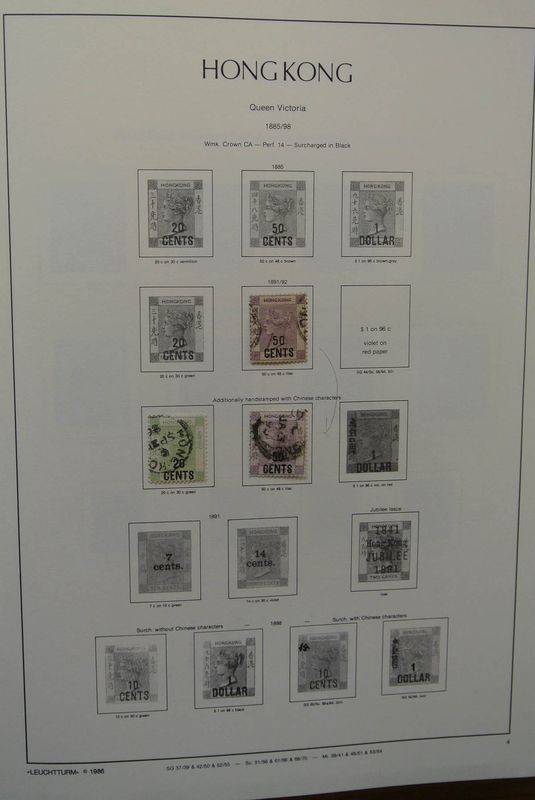 ÷ 1863-2011, anfänglich ungebraucht und gestempelt, ab ca. 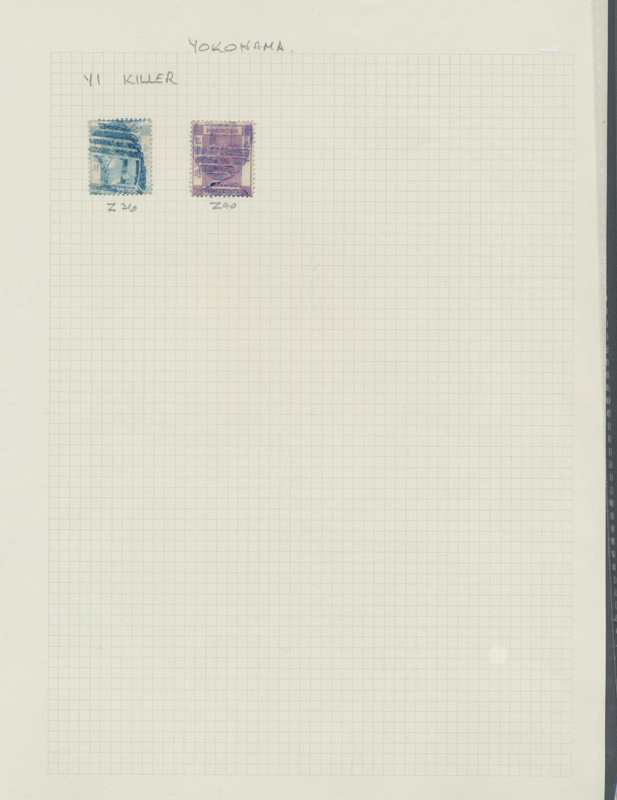 1960 dann nur noch tadellos postfrische Sammlung in zwei Bänden ab Mi.Nr. 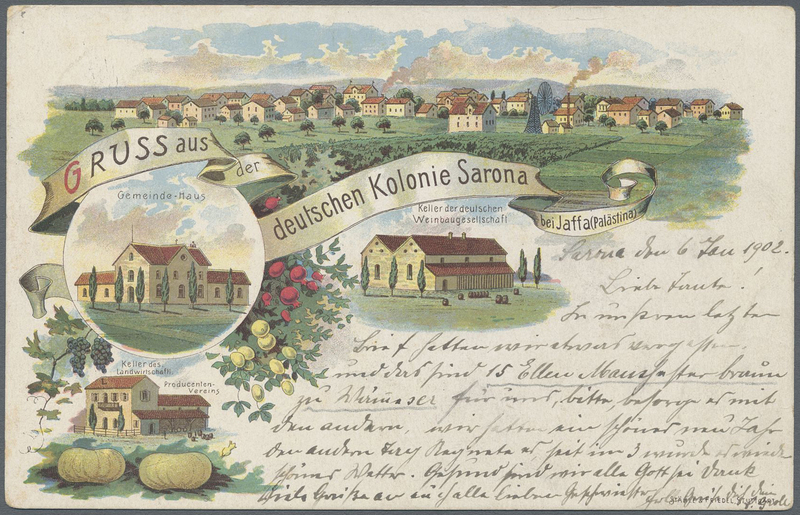 8-15 gestempelt mit besseren Werten und Sätzen wie Mi.Nr. 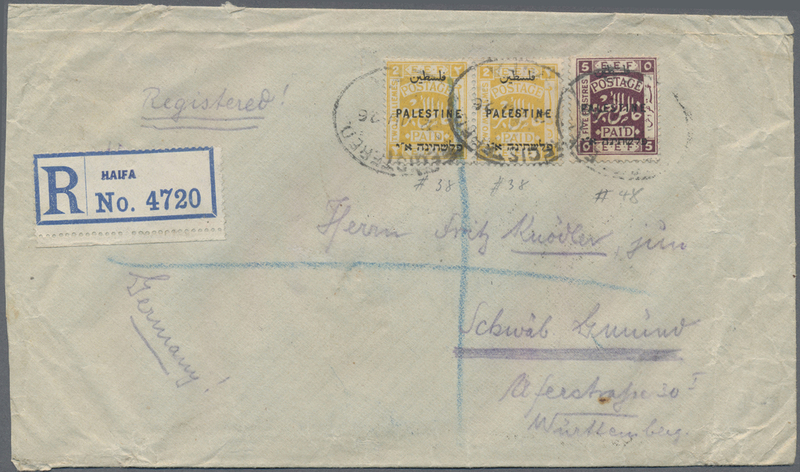 46-47 gestempelt, Mi.Nr. 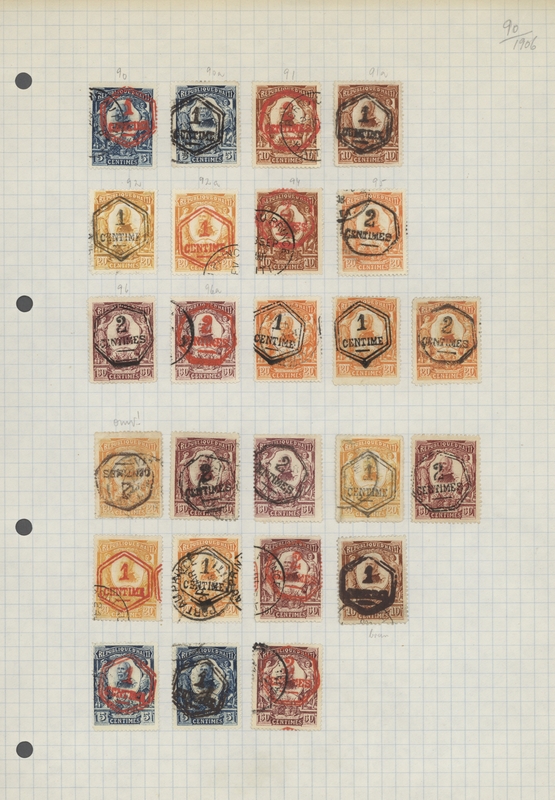 132-38 ungebraucht und gestempelt, Mi.Nr. 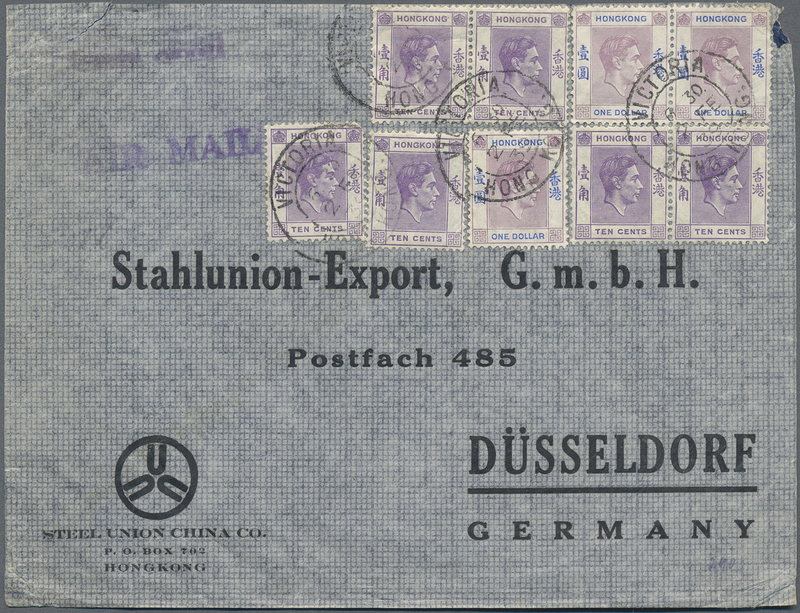 173-76 ungebraucht, Mi.Nr. 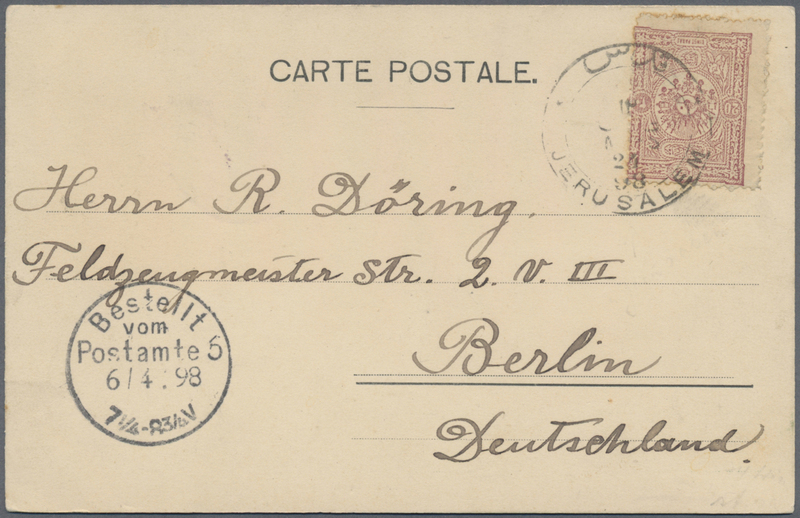 246-47 postfrisch usw., dabei auch ca. 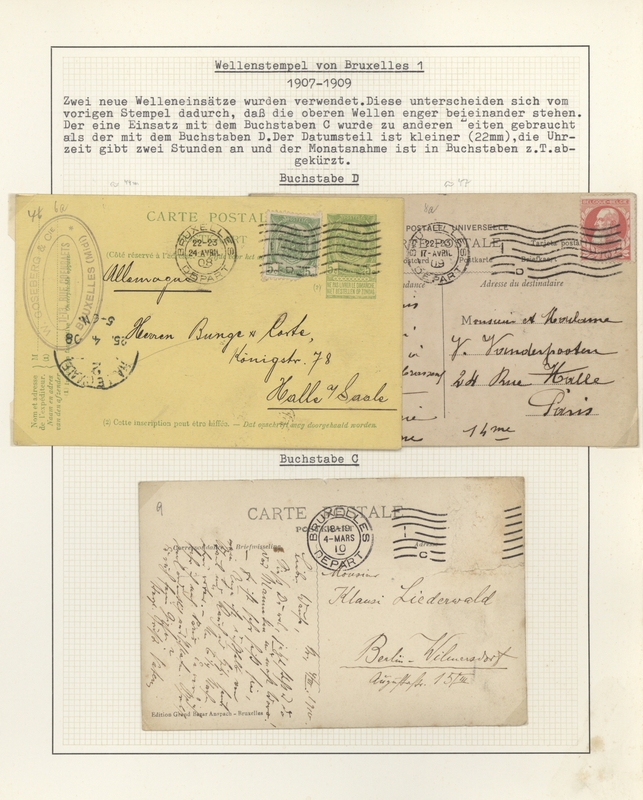 100 postfrische Blockausgaben ab Block 1, Kleinbogen und Markenheftchen, Mi. ca. 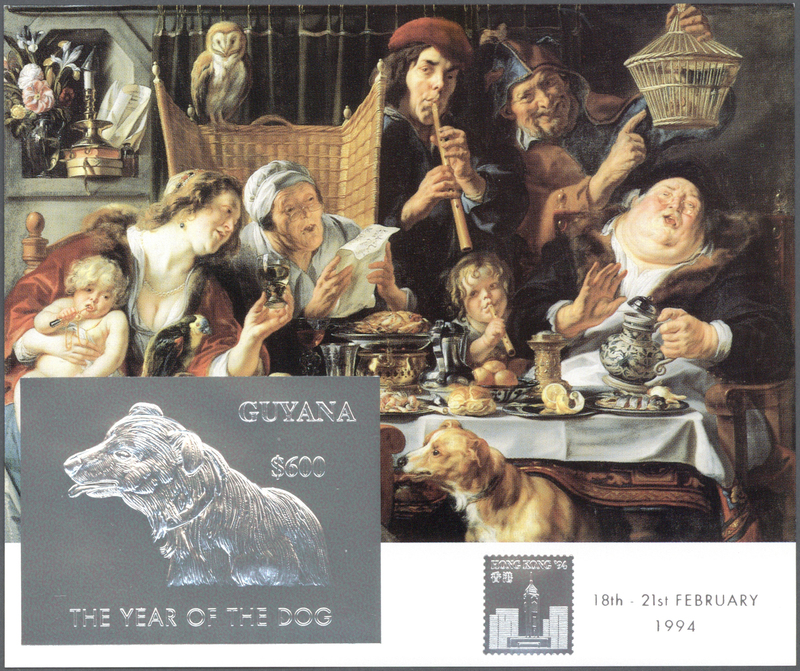 4.700,- Euro. 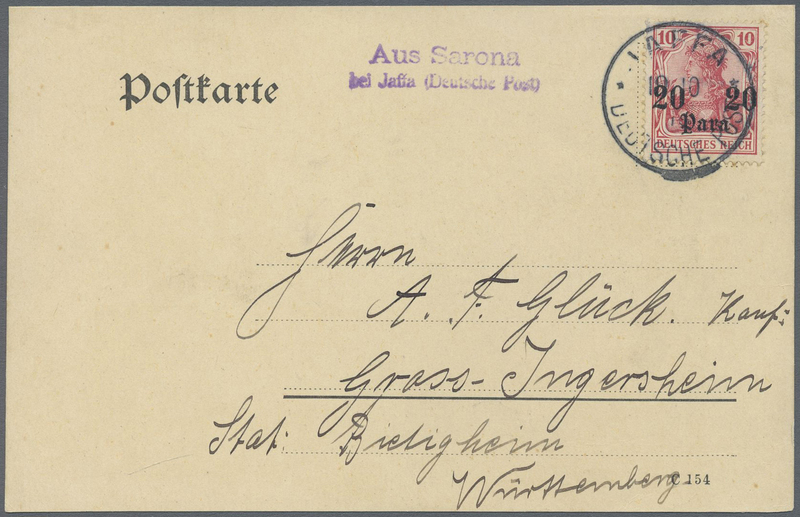 29844 Brief (cover) Ansichtskarte (Picture postcard) 1902/48, covers (5, mostly air mail) or ppc (2) to England or USA. 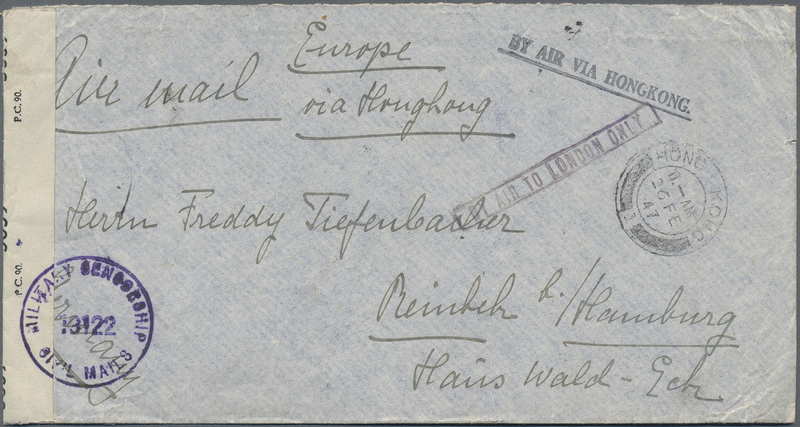 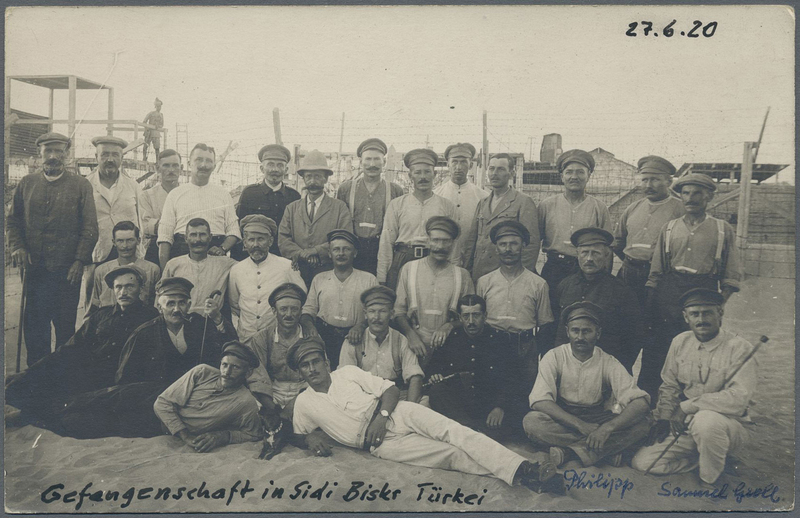 29845 Ansichtskarte (Picture postcard) Brief (cover) gefälligkeitsgestempelt (complaisance-marked) 1915/58, cards mint/cto/used (6) inc. two 1915 usages Kwangtung province to Hong Kong. 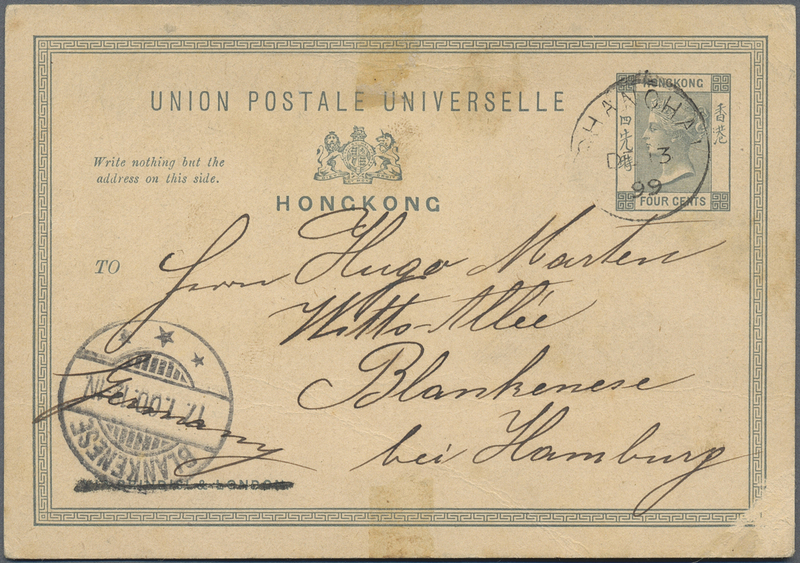 29846 postfrisch (never hinged) ** 1937/2008, u/m collection in two stockbooks, well collected throughout with better issues and apparently from 1970s onwards virtually complete. 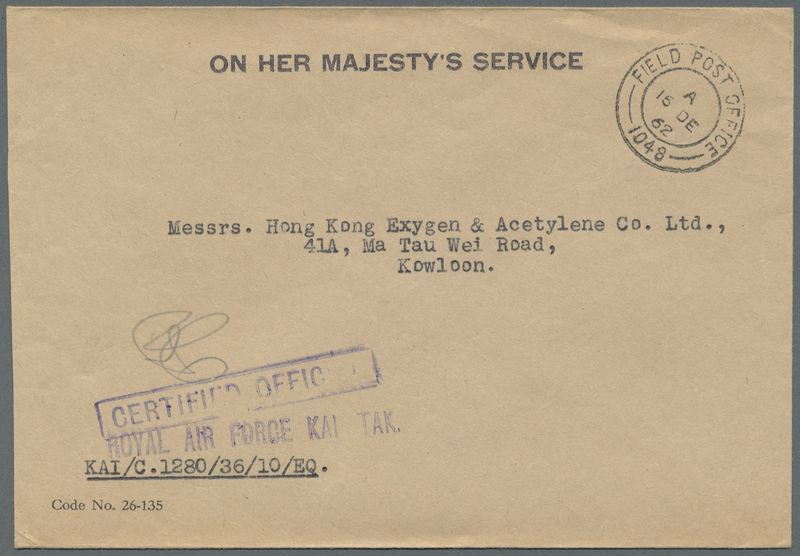 29847 Brief (cover) 1951/1983 - British Forces in Hongkong: 43 covers used from British F.P.O. 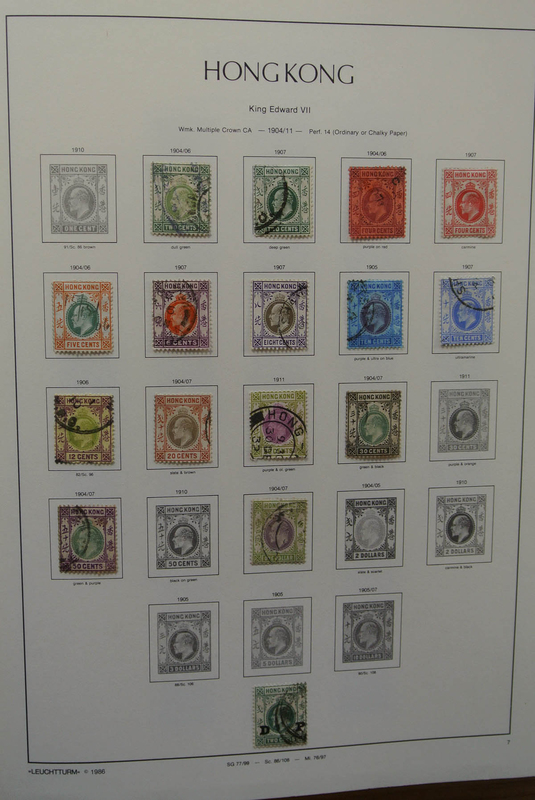 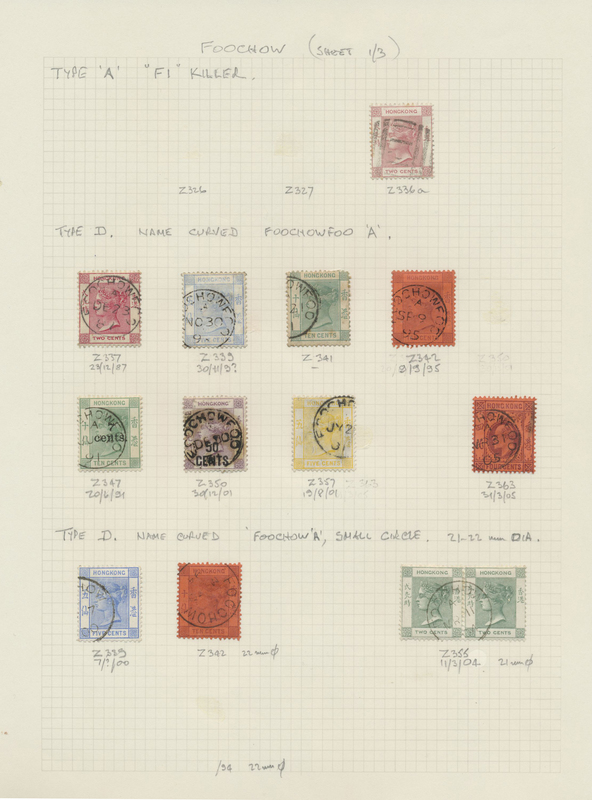 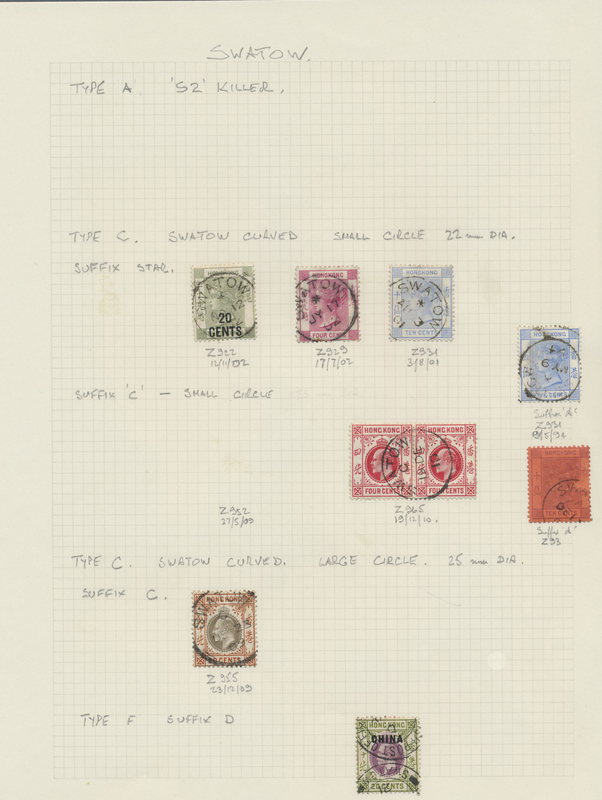 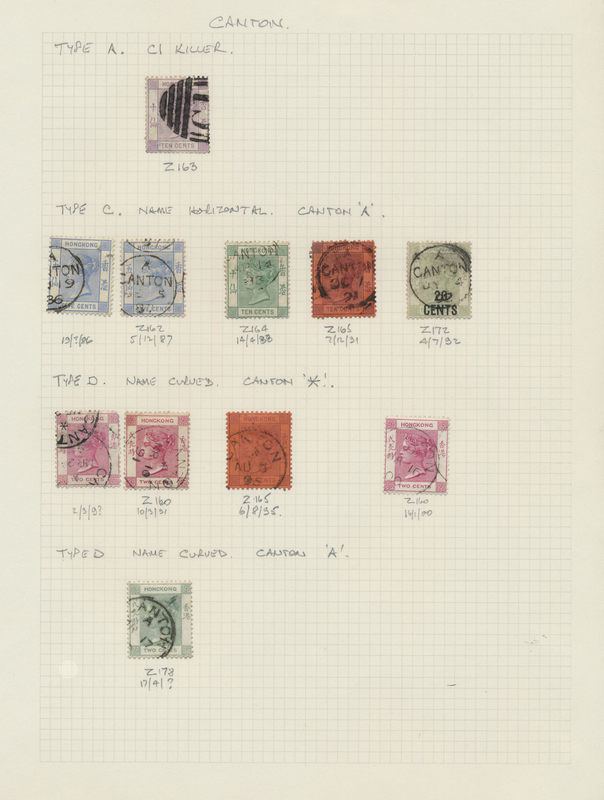 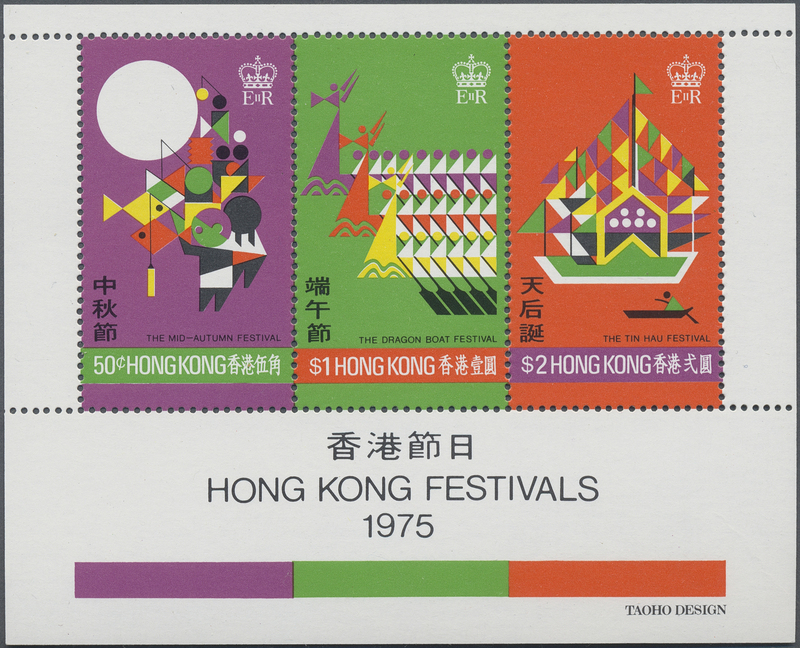 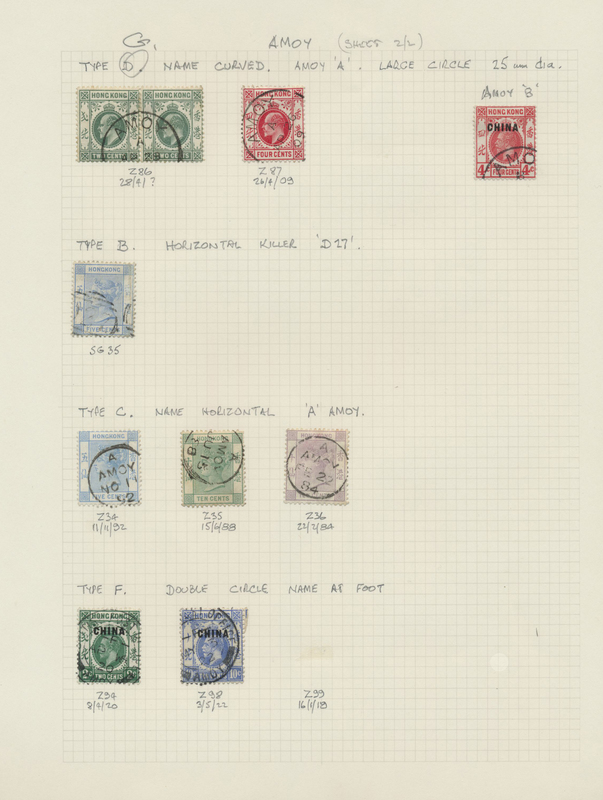 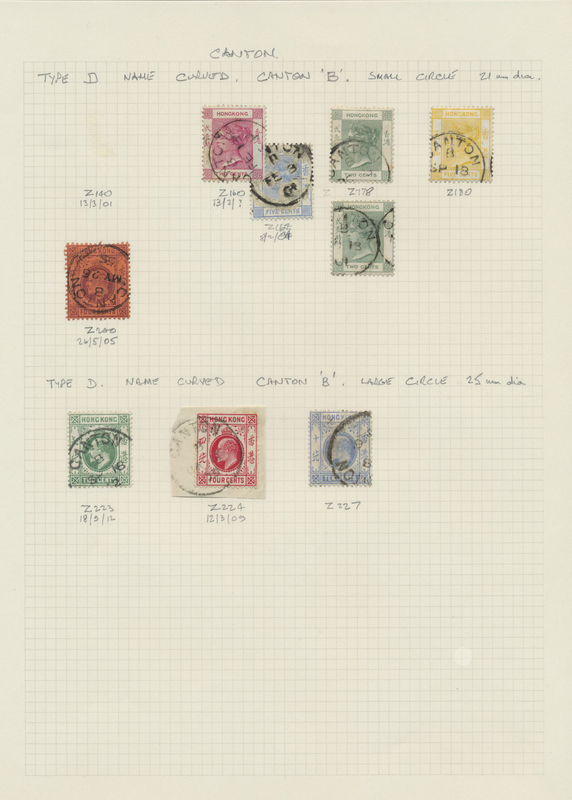 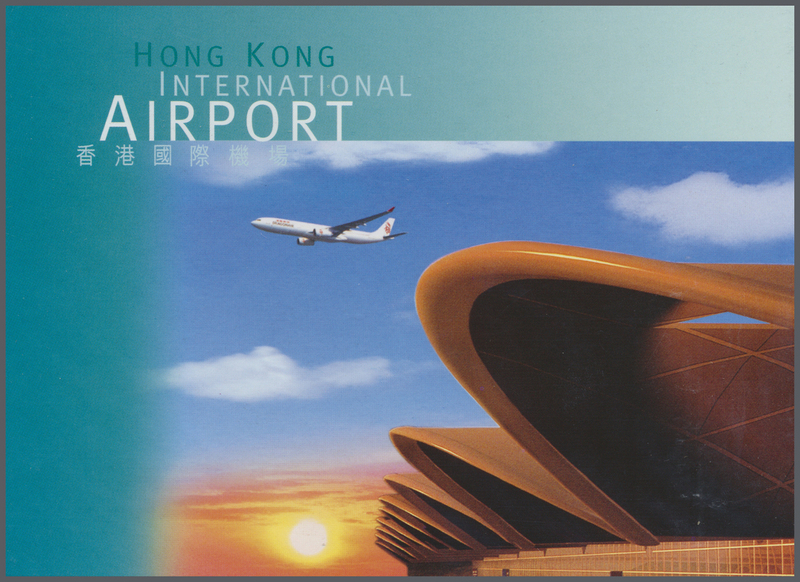 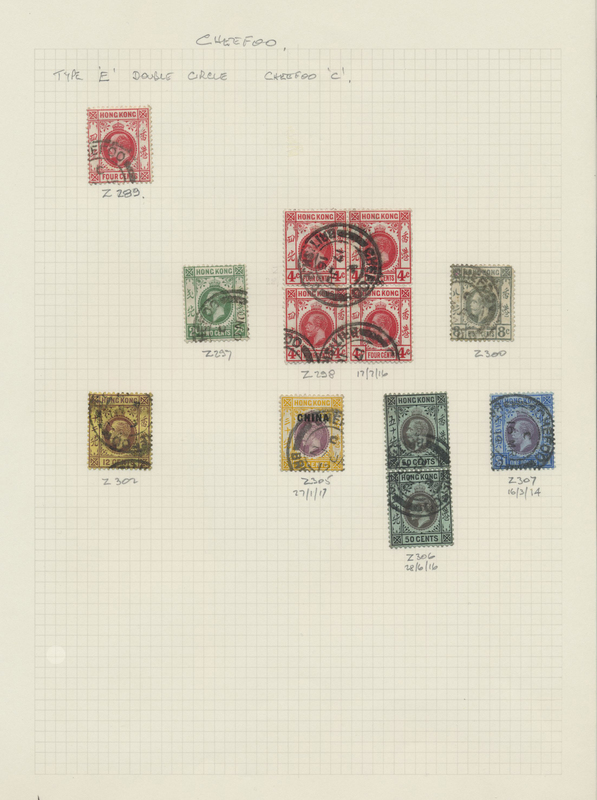 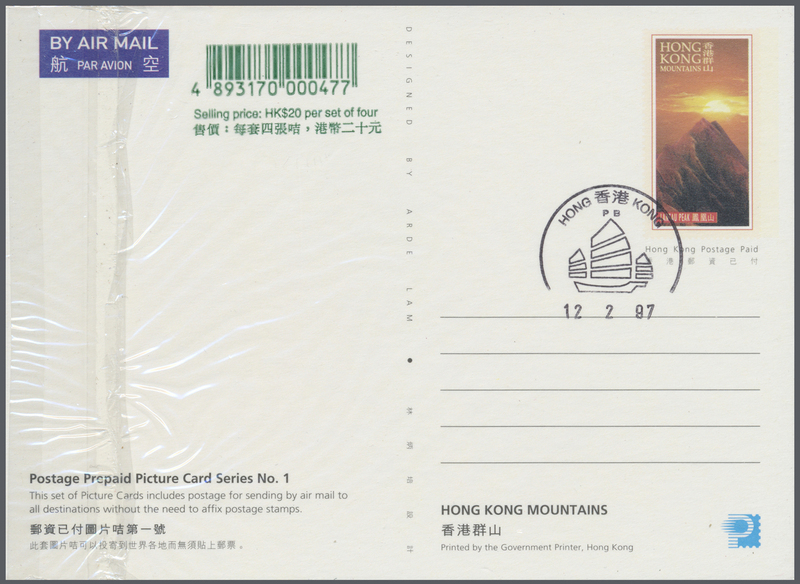 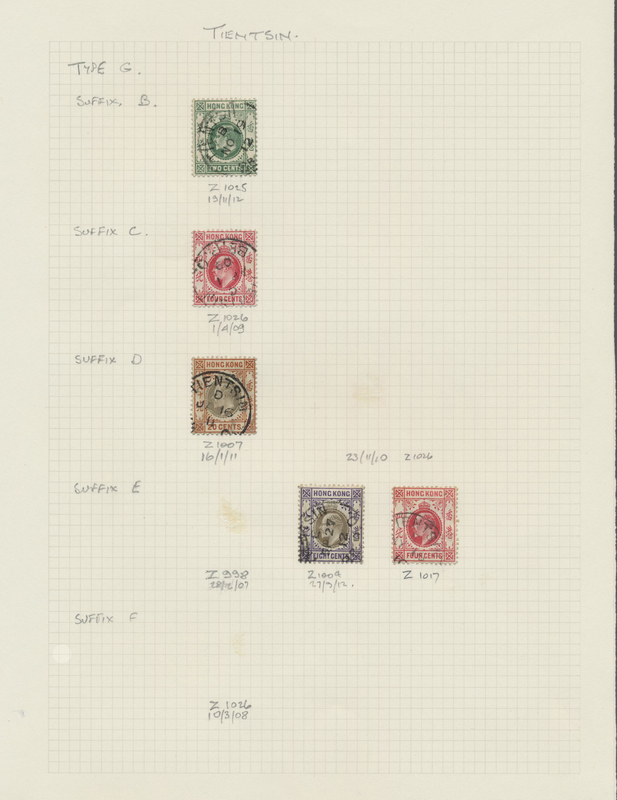 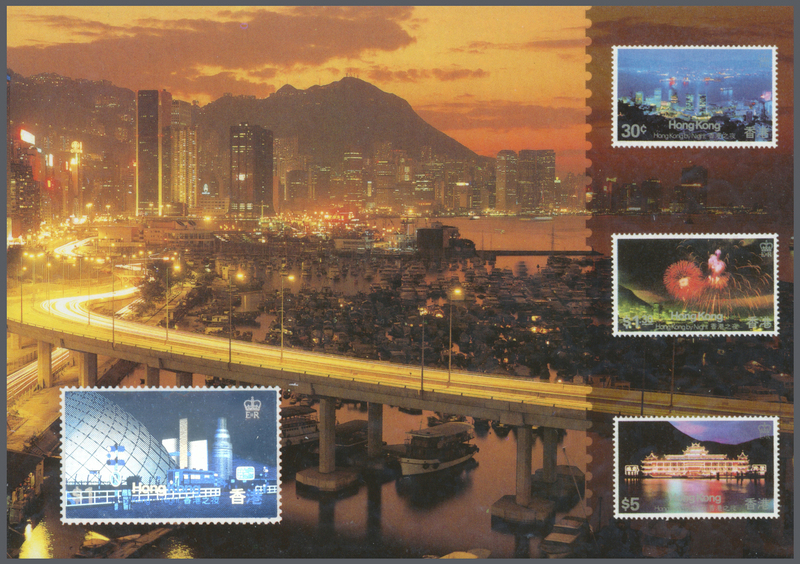 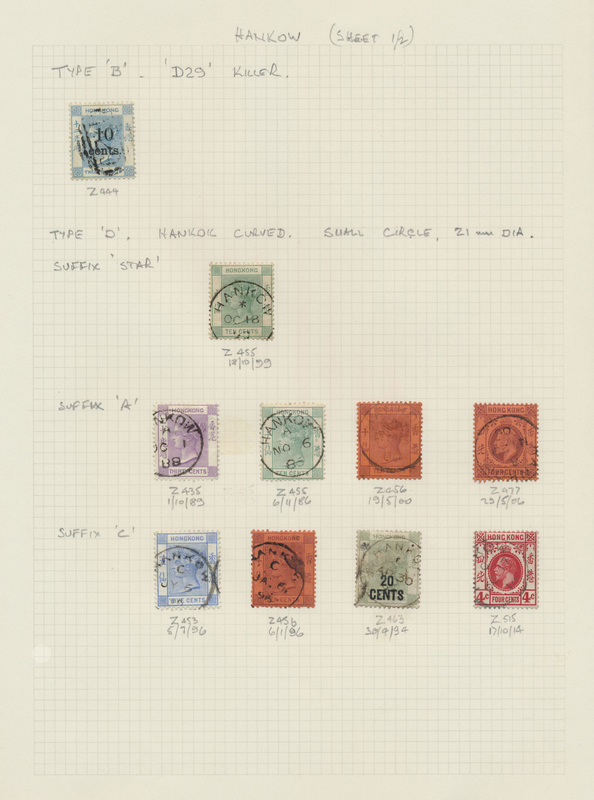 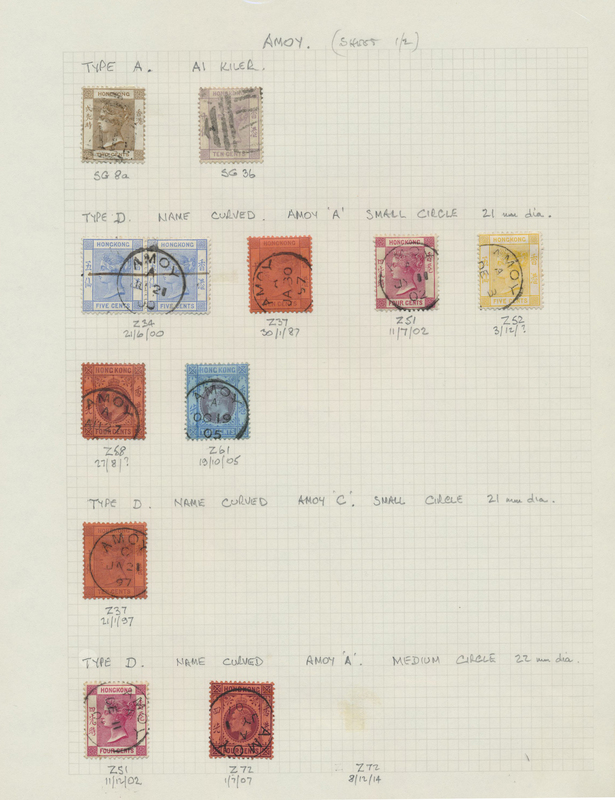 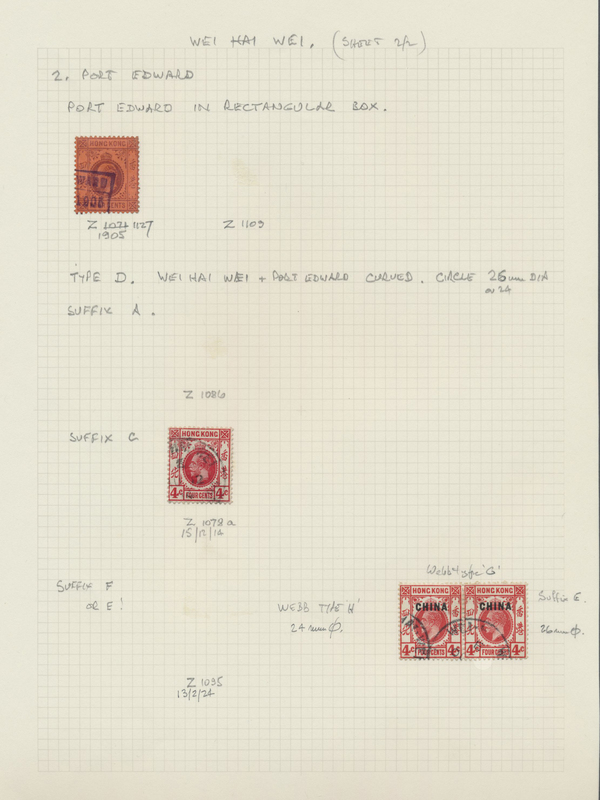 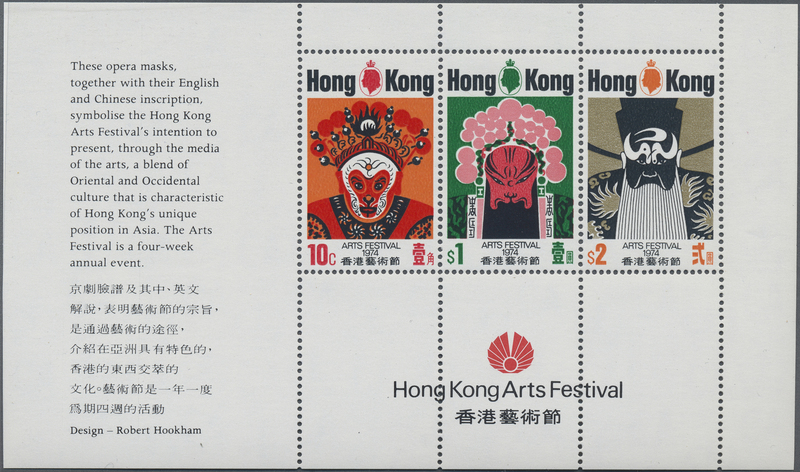 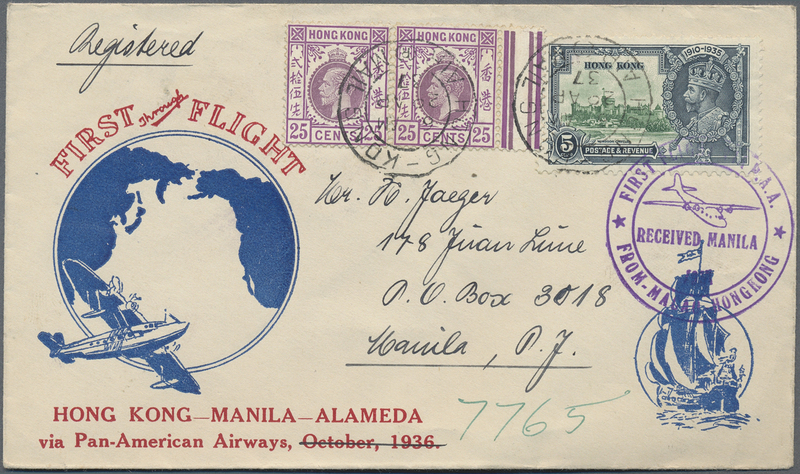 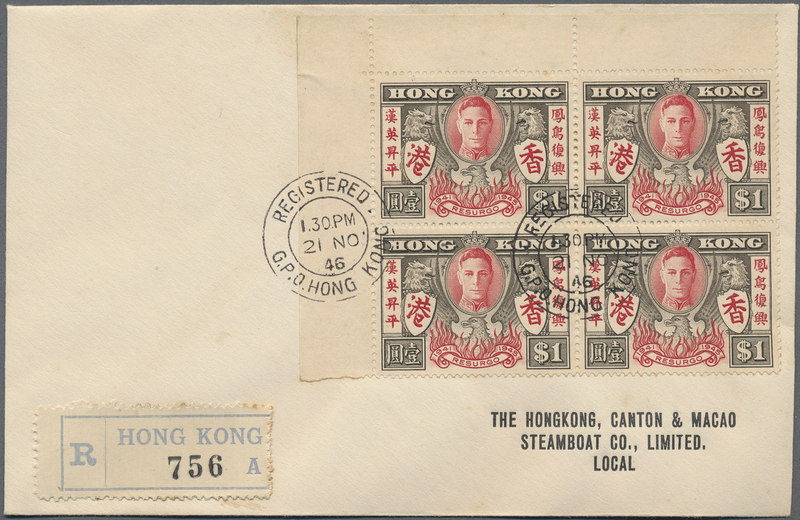 's Hongkong, some franked, stampless else, few registered, with a lot of different F.P.O. 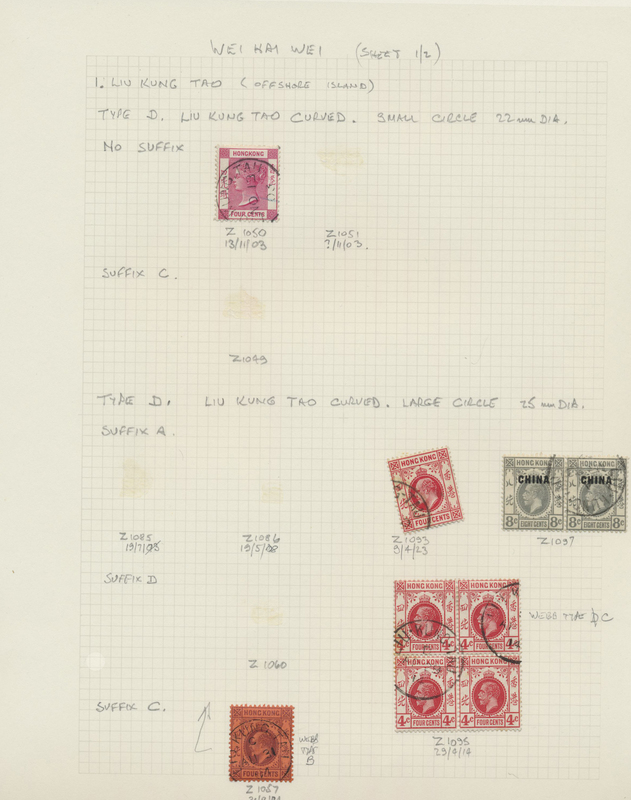 datestamps, sender cachets (Land Forces, Naval Base, Royal Air Force, "69 Gurkha", "Area Accounts Officer", Local Resources, etc. 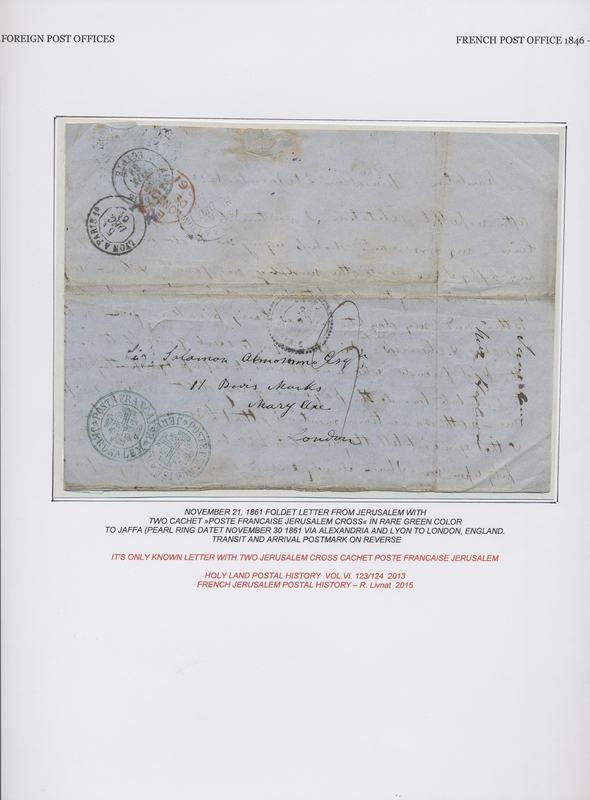 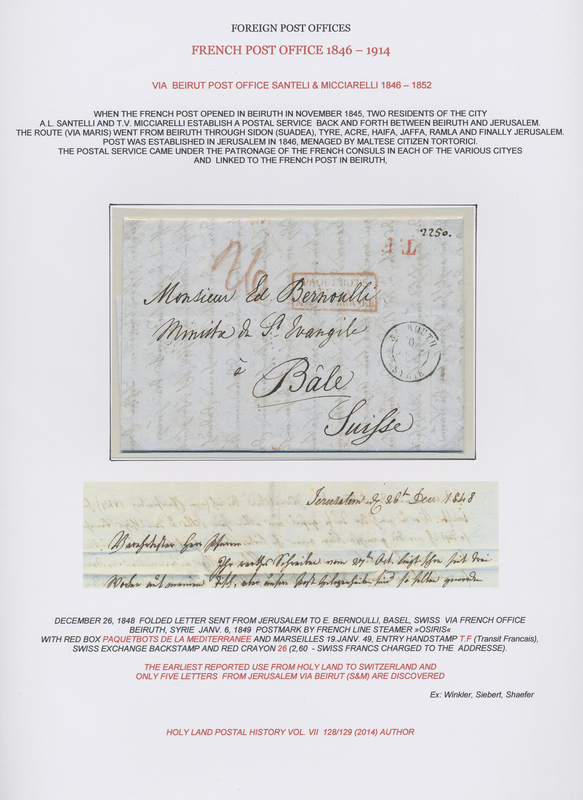 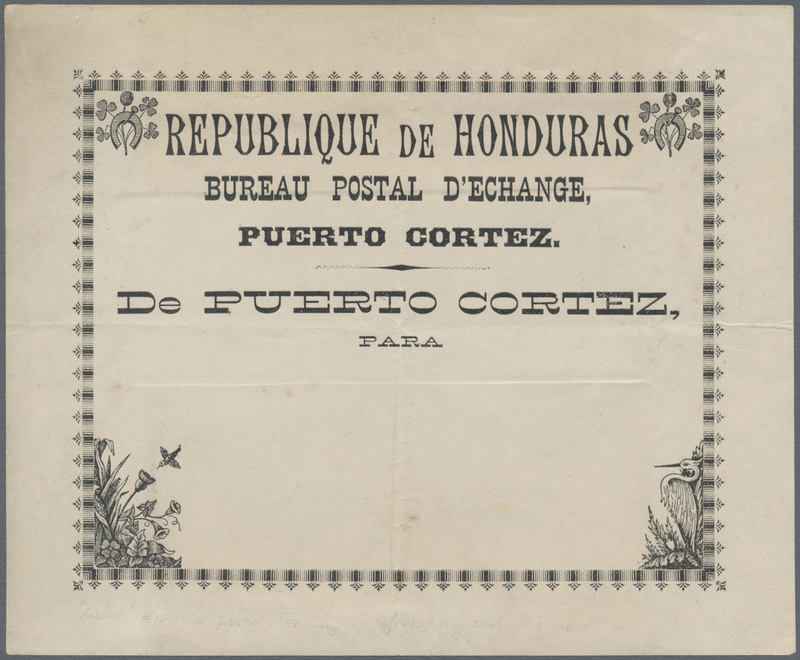 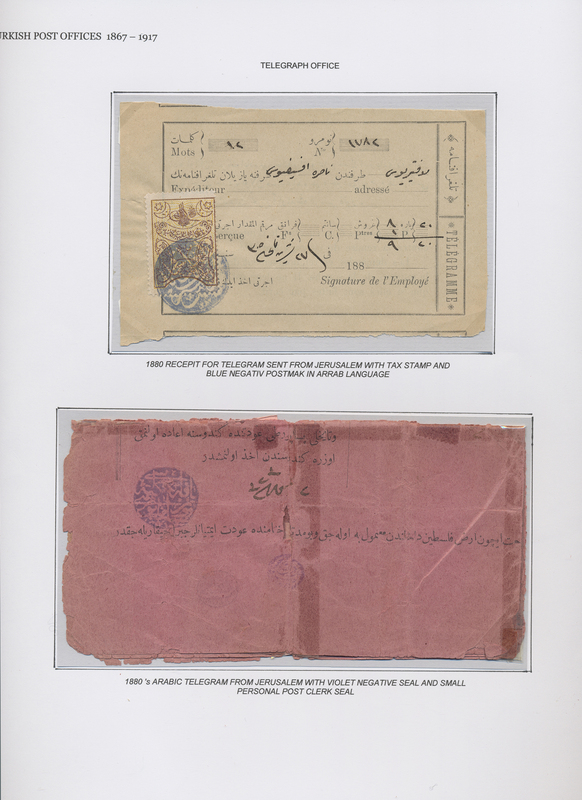 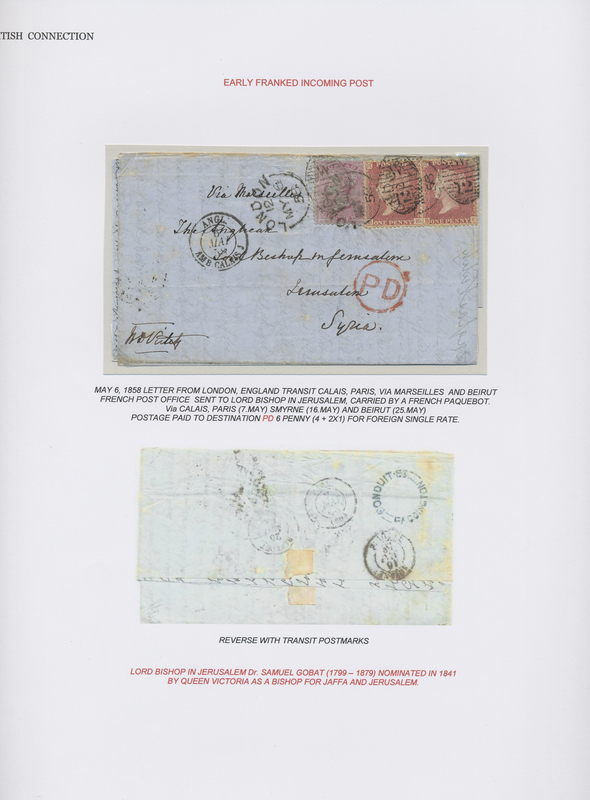 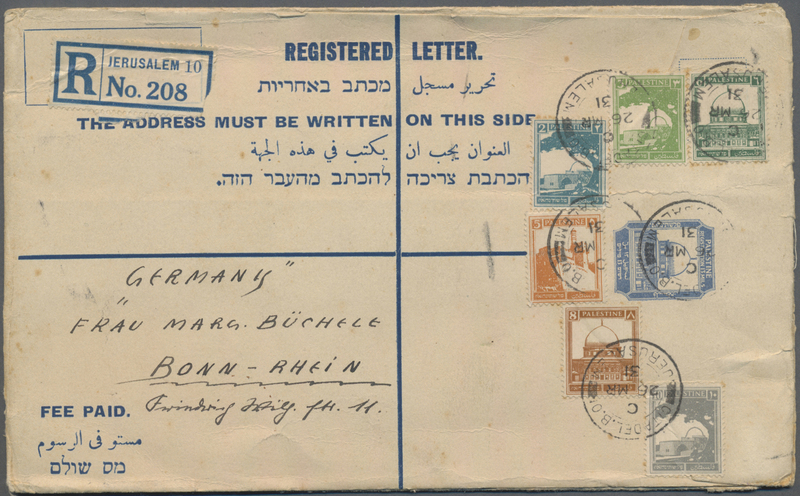 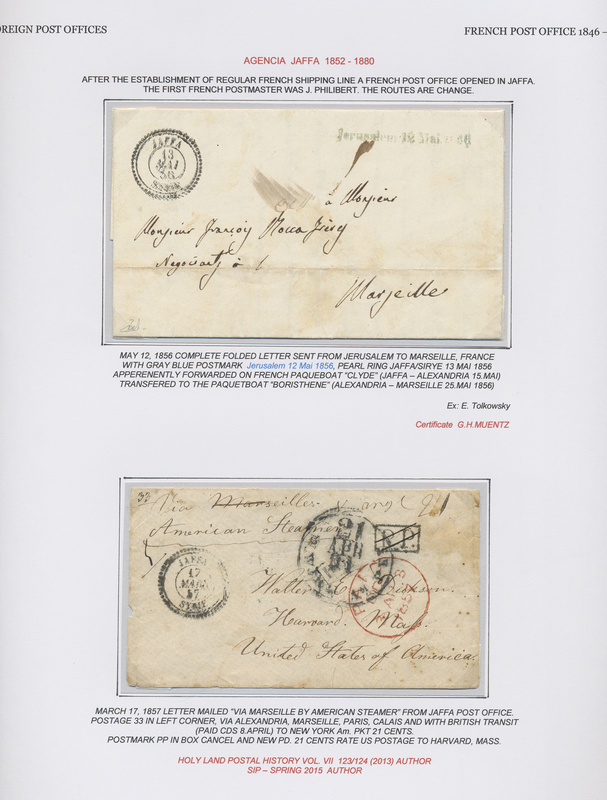 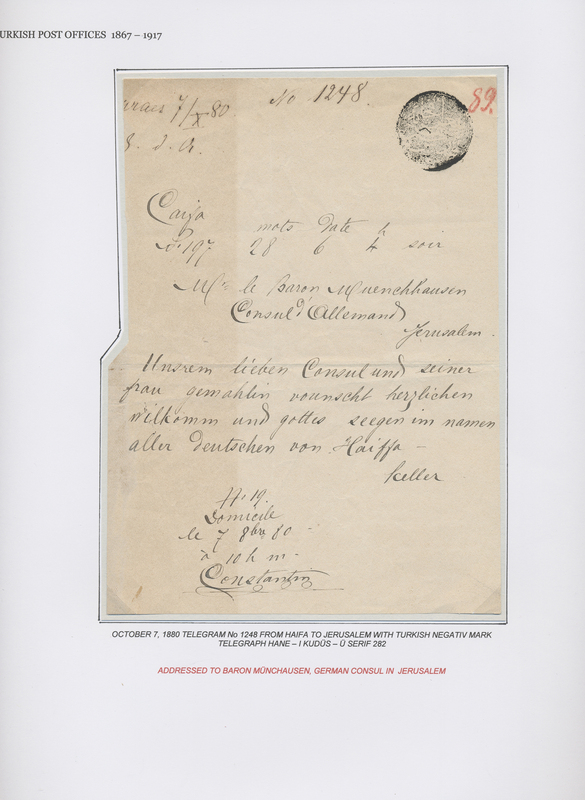 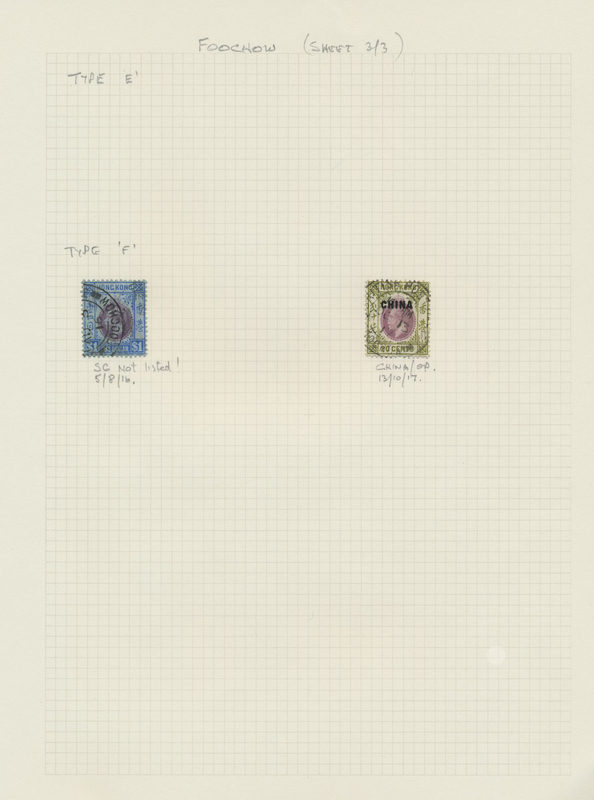 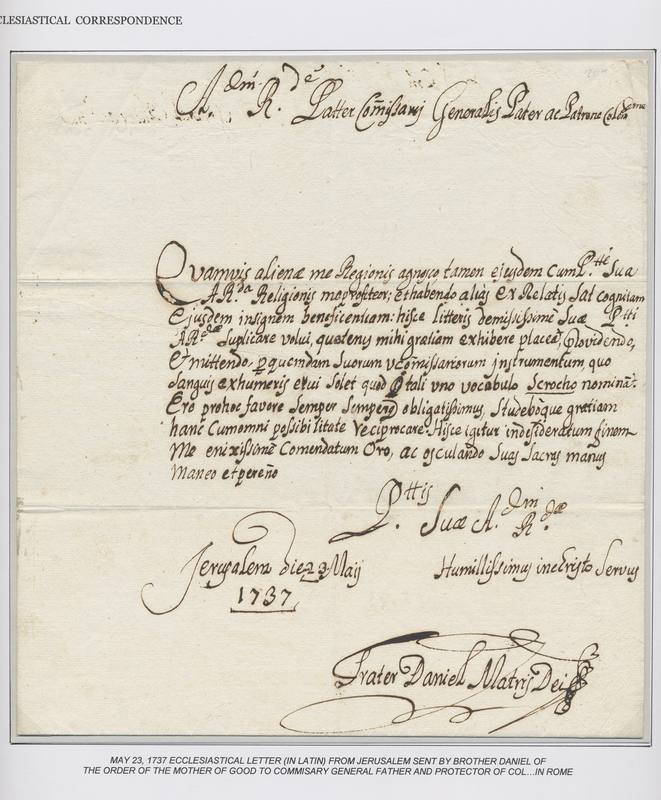 ), Official mail, various censor marks, and other interesting field post details. 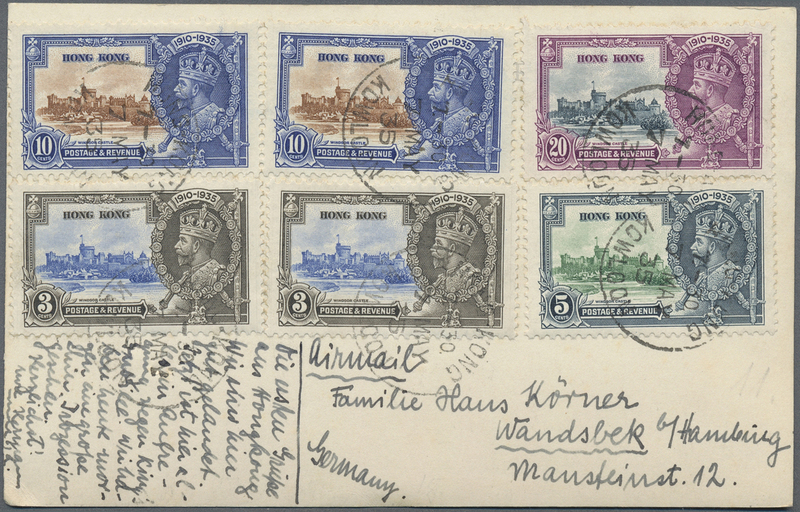 29848 postfrisch (never hinged) ** 1972-97, Mint collection on printed hingeless pages in a Lighthouse album, almost complete with souvenir sheets, definitives of various papers/watermarks (including 1976 set on unwatermarked paper) etc., obviously all fresh and very fine. 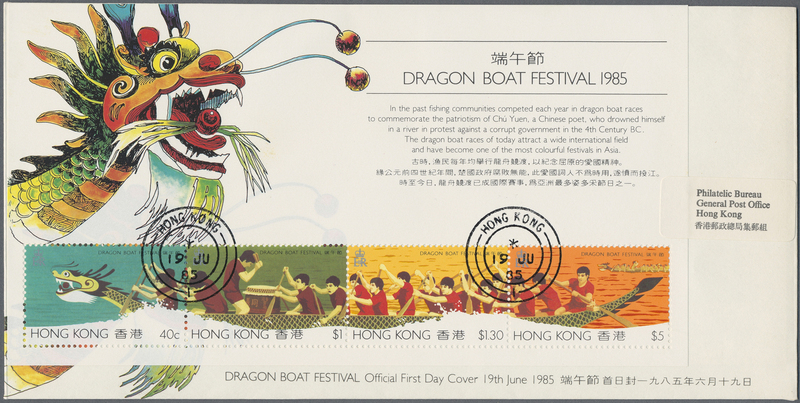 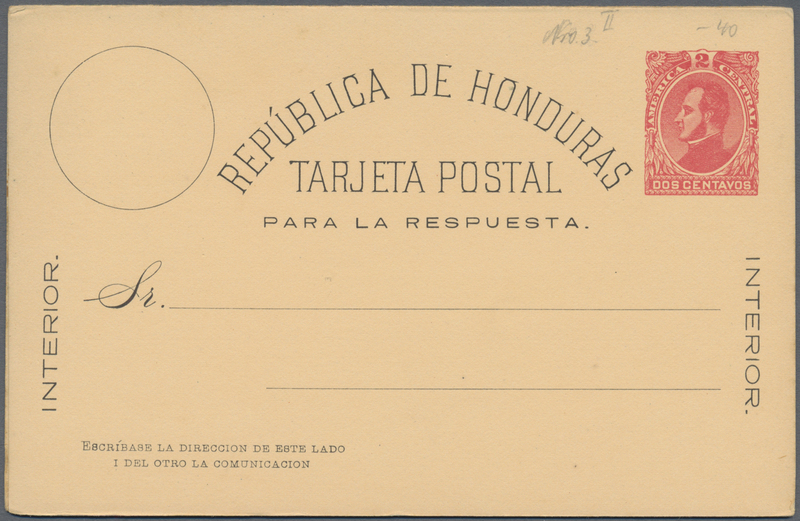 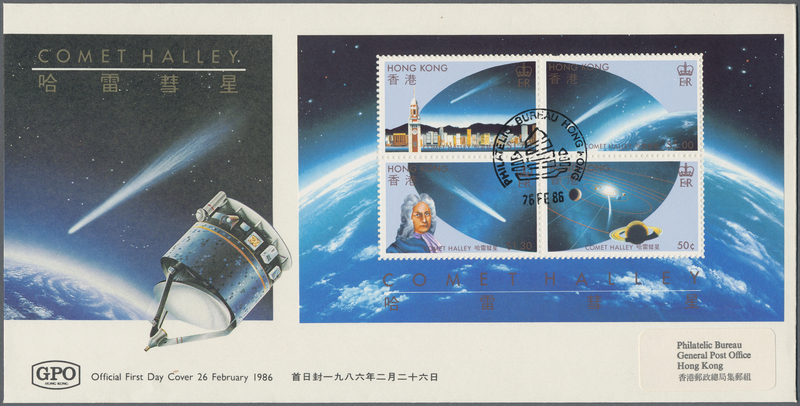 29849 FDC 1979/1999, collection/accumulation of apprx. 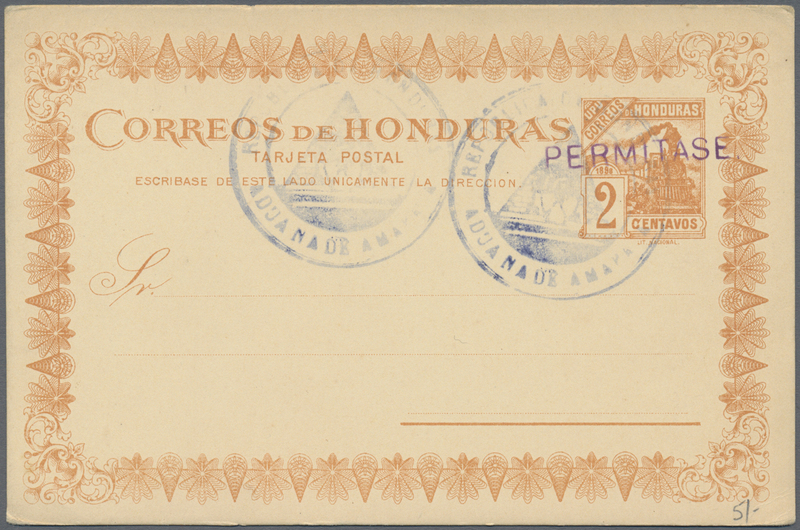 420 f.d.c. 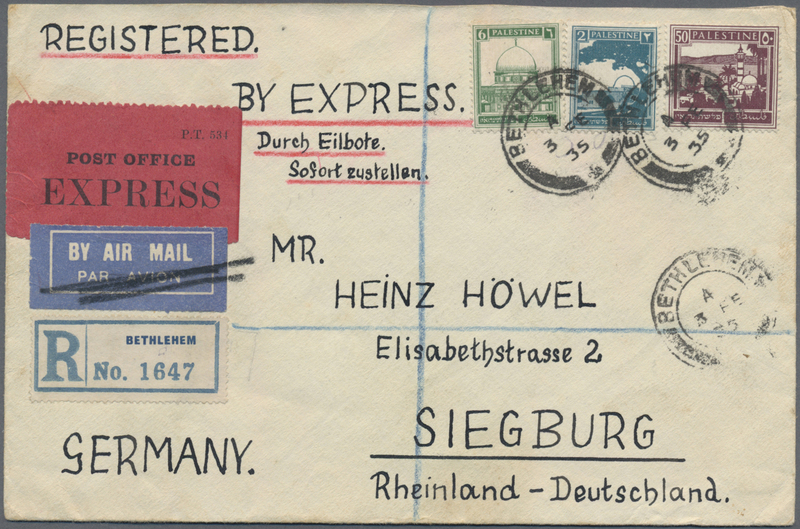 incl. 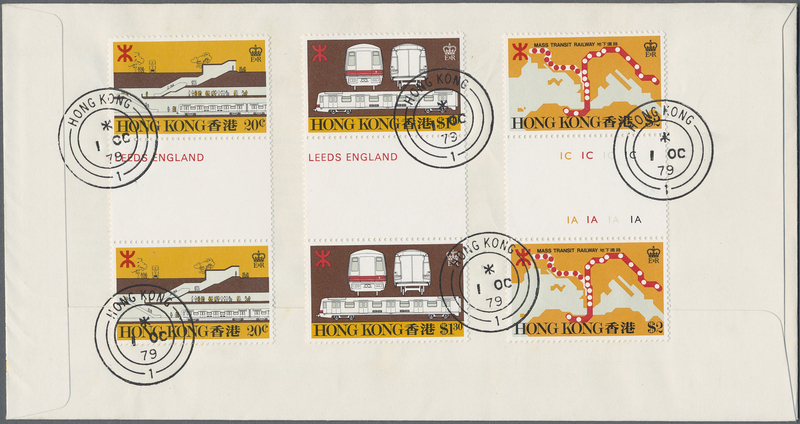 souvenir sheets and also some gutter pairs. 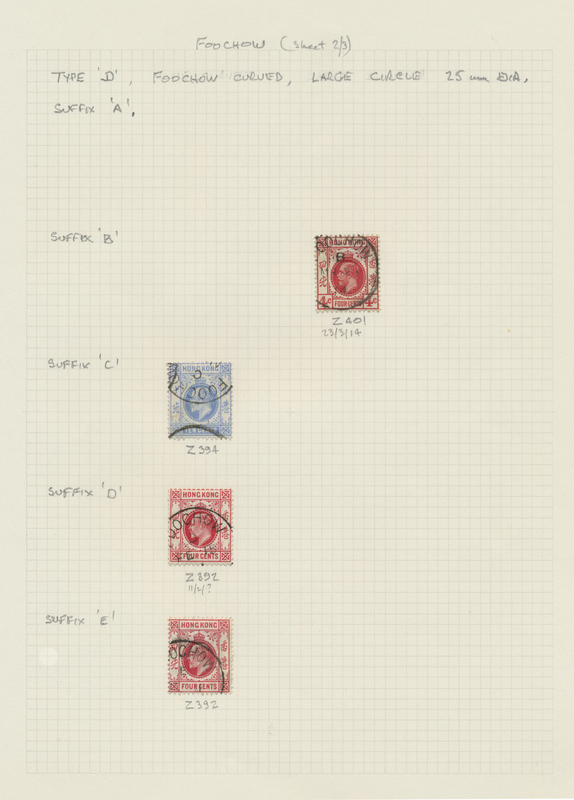 High cat.value! 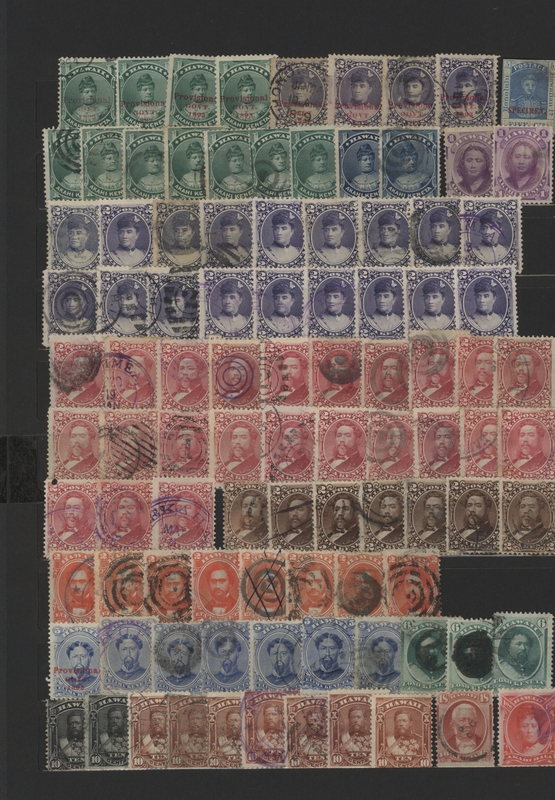 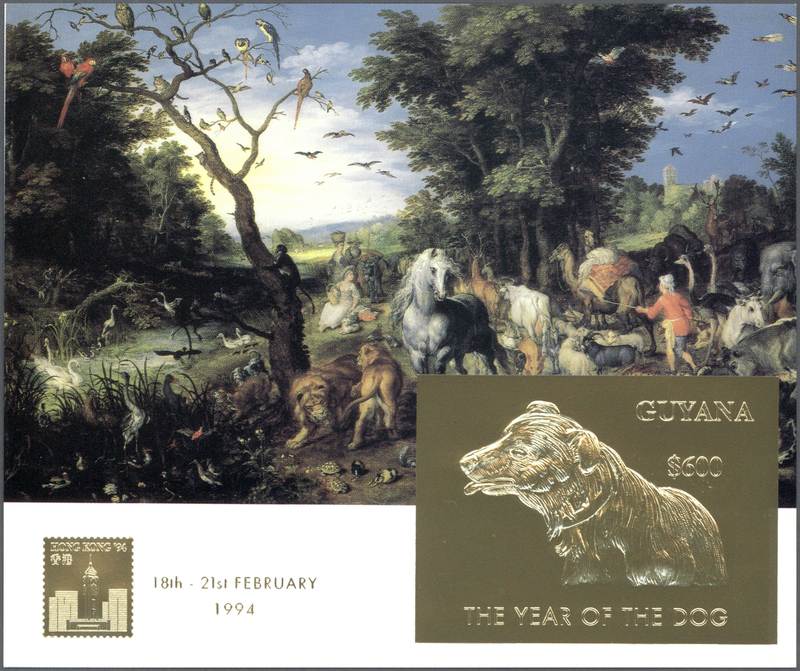 29850 postfrisch (never hinged) ** 1992/2001, u/m accumulation in three albums, comprising plate blocks, gutter blocks, coils, souvenir sheets, apparently only complete issues. 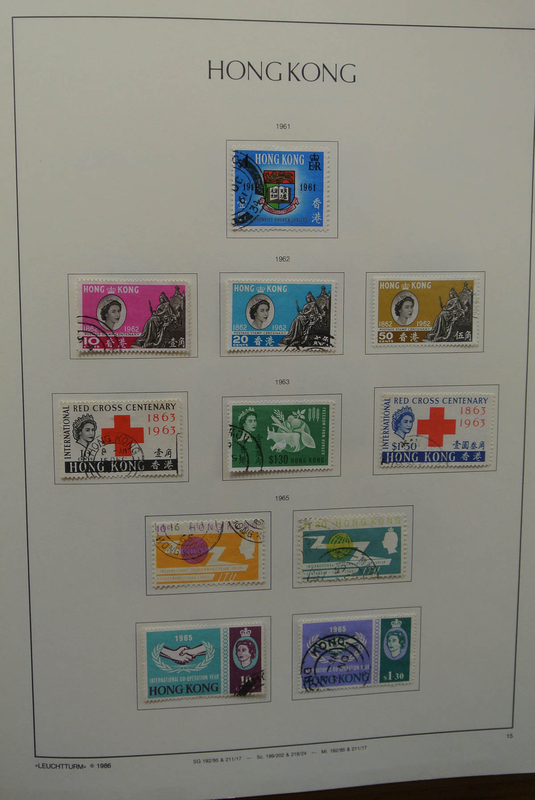 29851 postfrisch (never hinged) ** 1997-2010, Mint collection on hingless pages in 5 binders, with miniature sheets including the highly denom. 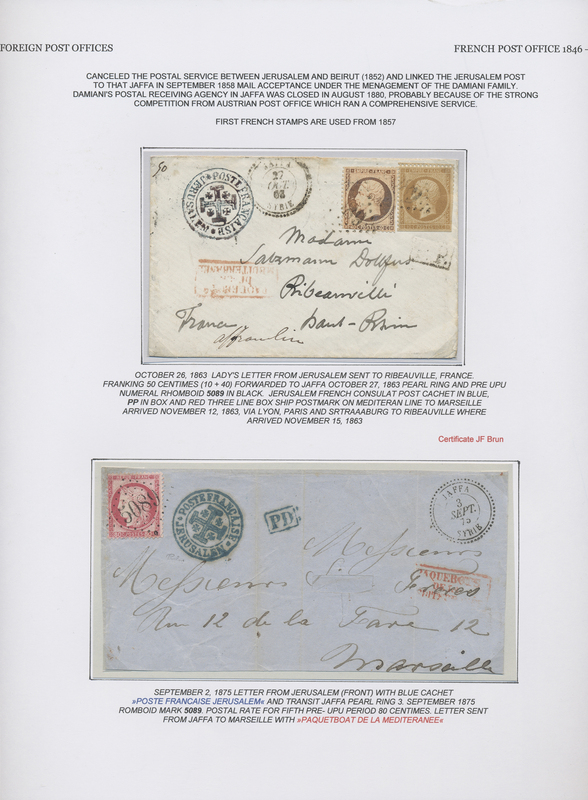 $50+$50 sheets, souvenir sheets, also additions like se-tenant sheets, booklets, presentation and special folders etc., mint never hinged, fresh and very fine. 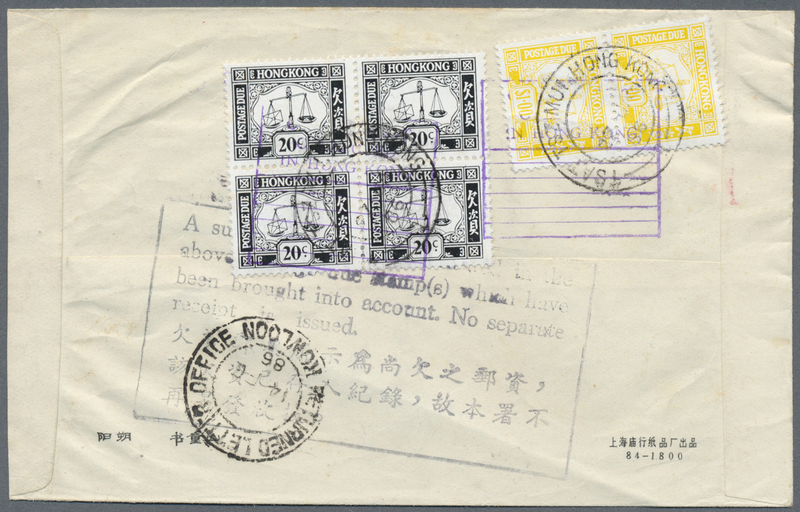 29853 Brief (cover) 1927/86, three covers: inbound from US with 6 C. pair 1927, local name card size unpaid w. green due meter stamp 1953, 1986 from China w. 20 C. block-4 and $1 pair. 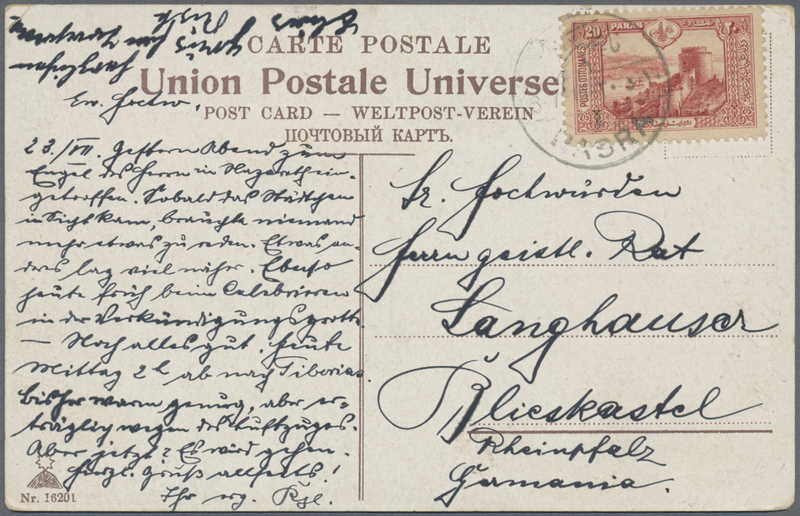 29856 Ganzsache (Complete) 1885-1915, six different postal stationery cards used, including QV 3c. 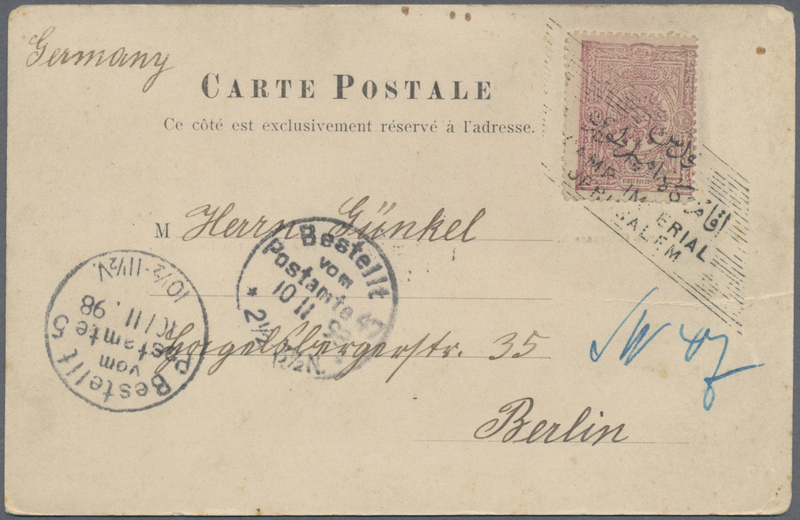 card to Germany in 1885, other cards to Ireland and Germany, one card with advertising (Smart Bowler Hats) printed on back used locally, and a card KGV. 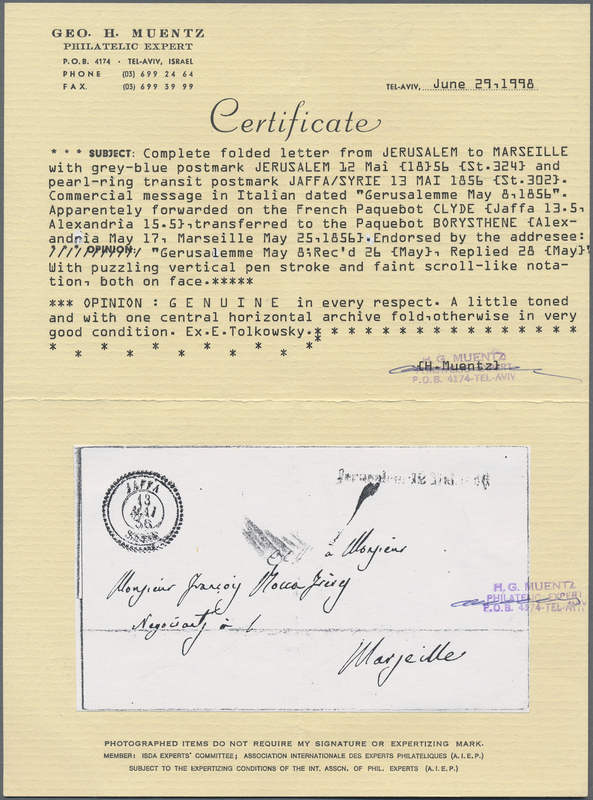 4c. 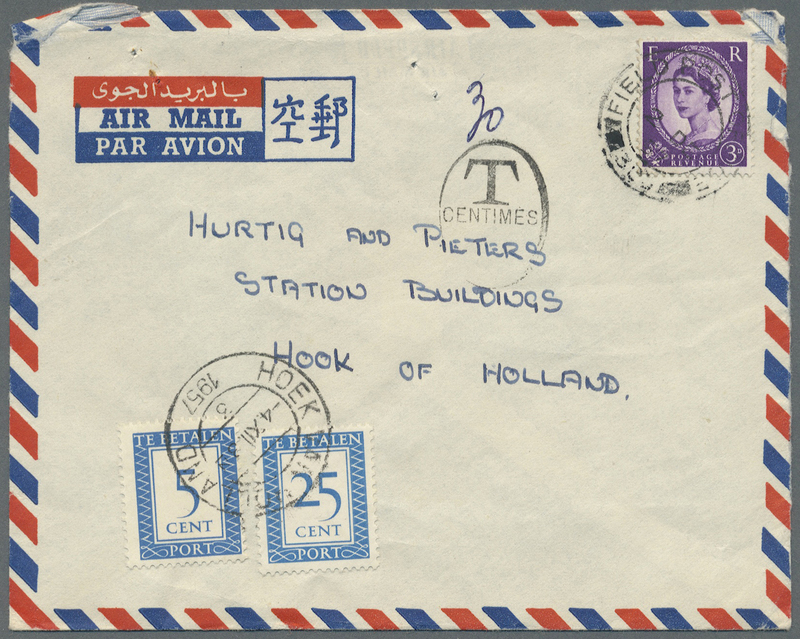 used from Tientsin to Leiden, Holland and redirected to Den Haag in 1915. 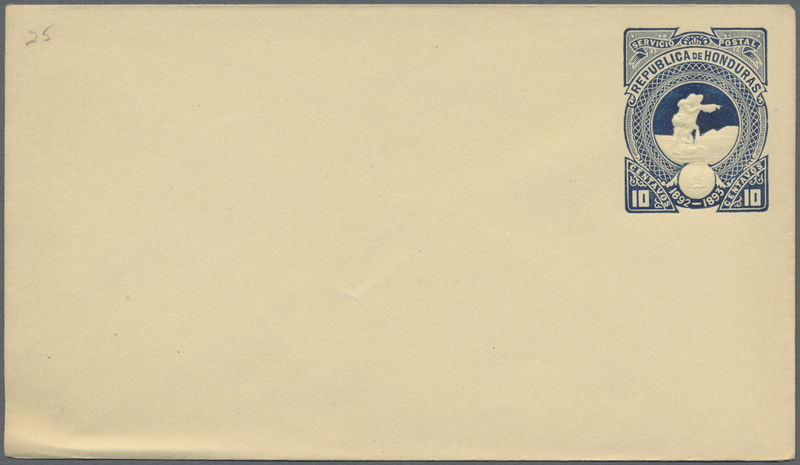 The last card with a central fold, good to fine else.